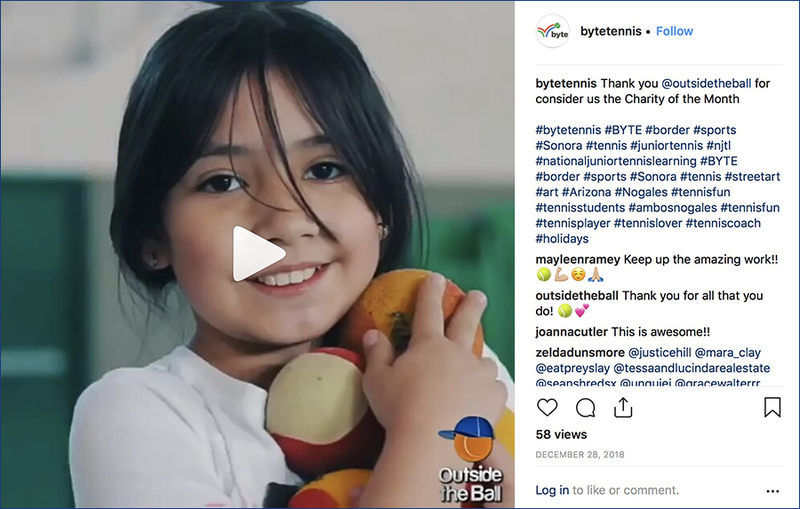 In December's Thankful Thursday, Outside the Ball introduced fans to the Border Youth Tennis Exchange, a bi-national youth development organization that uses tennis and academic enrichment on both sides of the US-Mexico border. BYTE shared our video to their social media followers on Instagram, Facebook & Twitter. 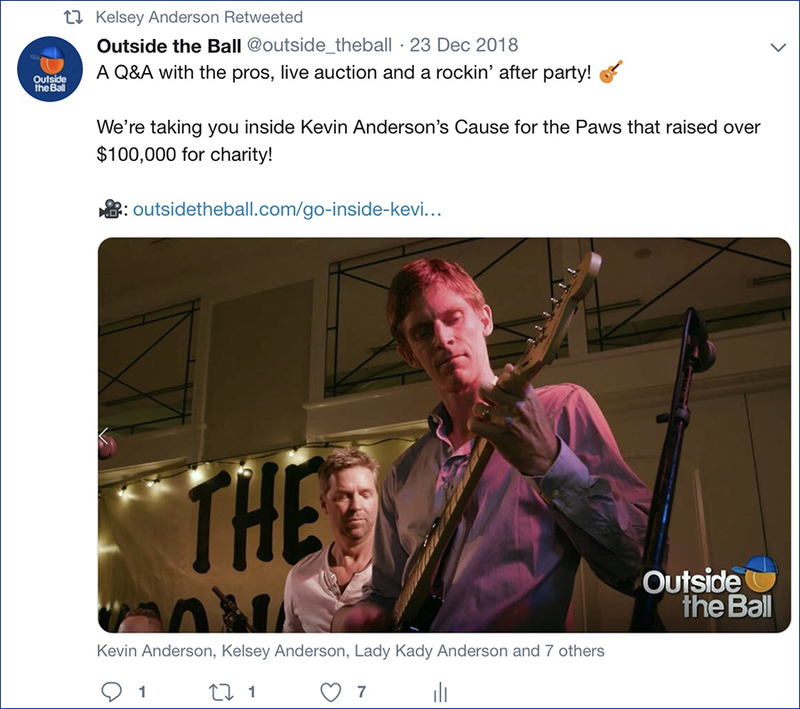 Outside the Ball was in attendance at Kevin Anderson's Grand Slam Cause for the Paws that raised over $100,000 for Dezzy's Second Chance dog rescue and Ocean Conservancy. Our cameras captured the Q&A with the pros, the live auction and exclusive interviews. 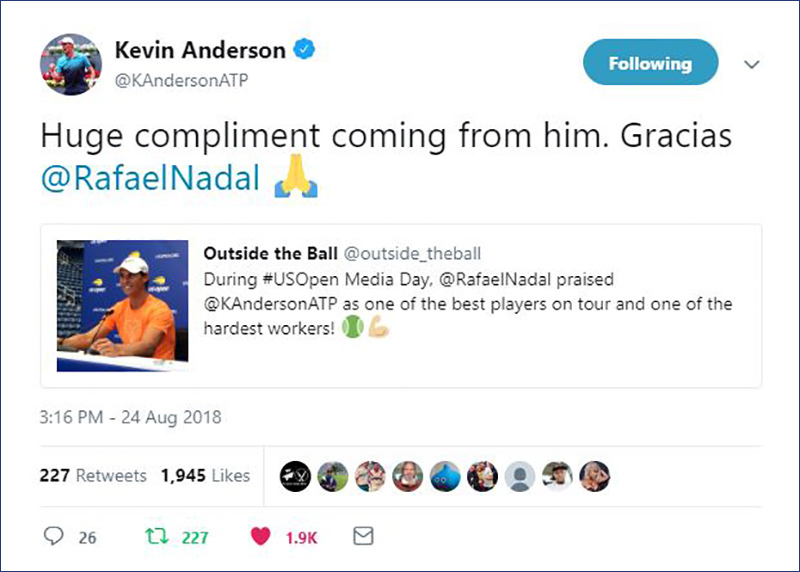 Kevin Anderson shared our video with his Facebook and Twitter followers, and his wife Kelsey also shared it with her Twitter followers. 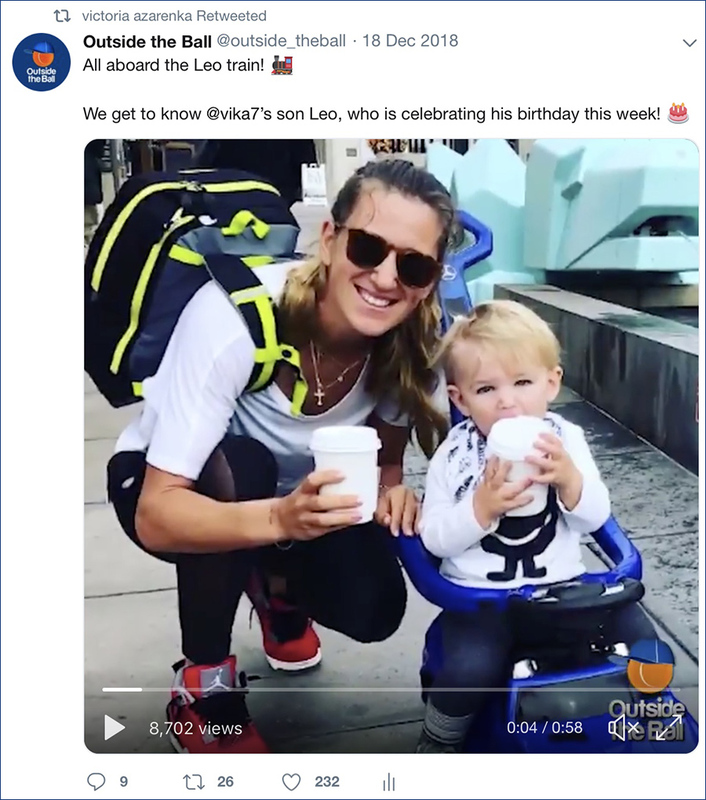 OTB host Mayleen Ramey spoke with Victoria Azarenka about her son Leo. The tennis star opened up about how she spoilers her son and moments she's looking forward to. Azarenka shared our interview with her Twitter followers. Outside the Ball was live Tweeting from Kevin Anderson's Cause for the Paws charity benefit. The event hosted a live auction and Q&A with the tennis stars to raise money for Dezzy's Second Chance dog rescue and Ocean Conservancy. 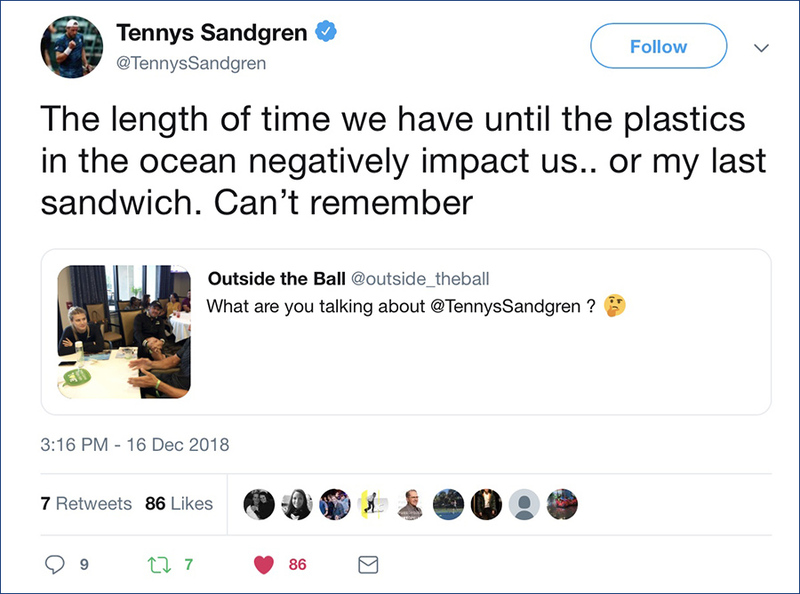 Kevin Anderson, Kelsey Anderson, Tennys Sandgren, and Shelby Rogers shared our live coverage to their Twitter followers. November's Thankful Thursday shines a light on the USTA's Junior Tennis & Learning Program that changes lives through tennis and education. 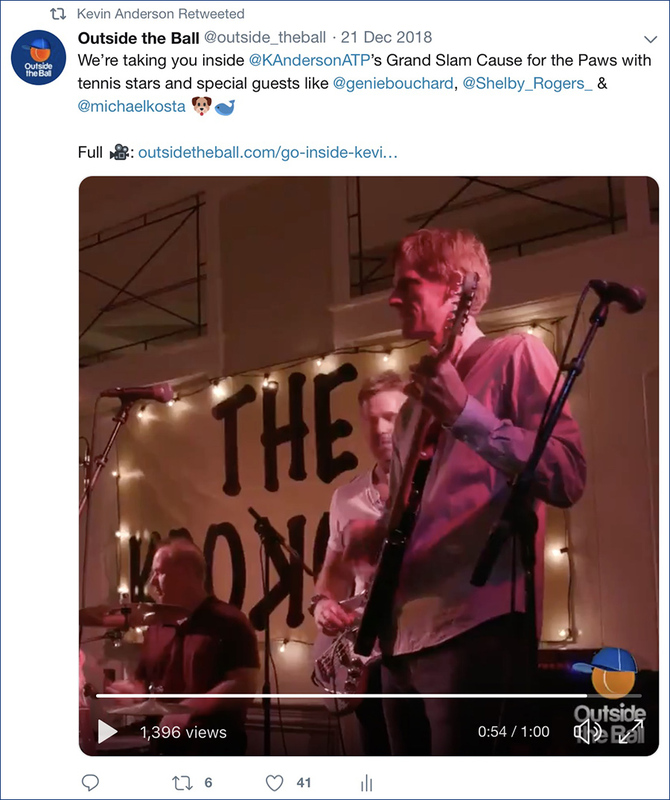 USTA Southern shared our video to their Facebook followers. Outside the Ball created a fun tribute for retiring tennis star Aga Radwanska. 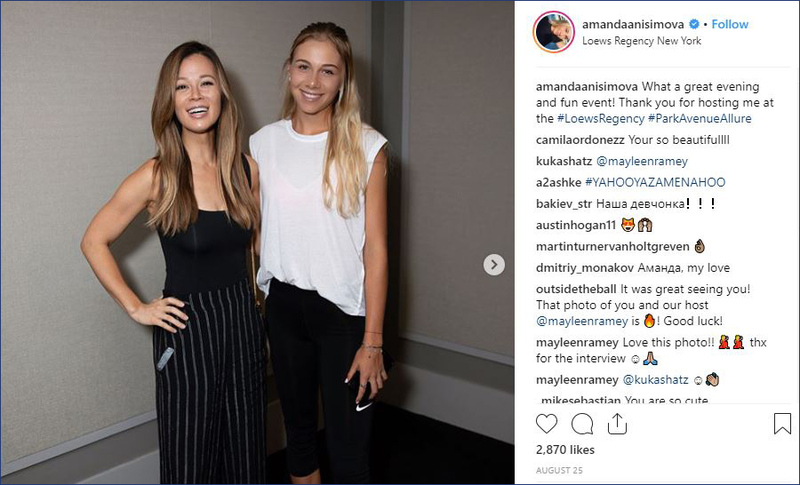 The montage included interview clips, tennis highlights, and sweet messages from fellow WTA players like Caroline Wozniacki, who liked the video on Instagram. 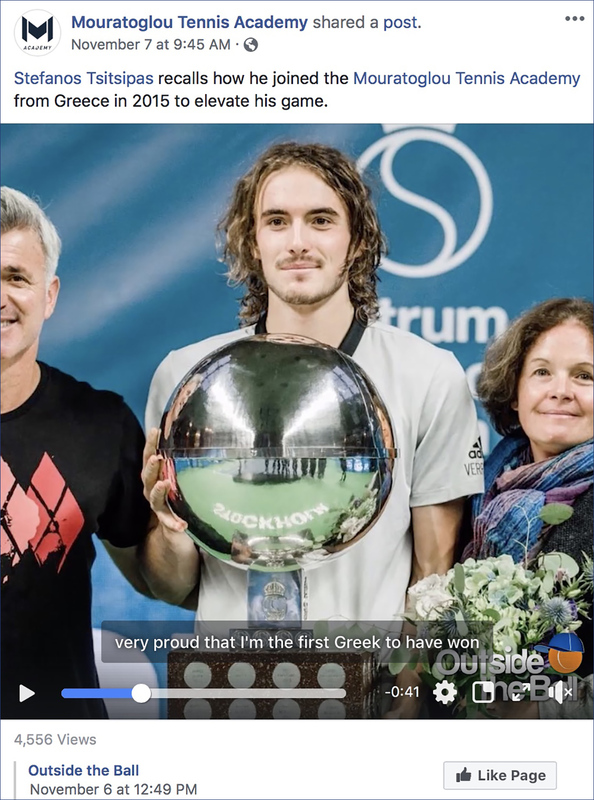 Outside the Ball interviewed Stefanos Tsitsipas at the Next Gen Finals in Milan Italy where he opened up about his historic win for Greece and the value of training at Patrick Mouratoglou's academy. The Mouratoglou Tennis Academy shared the interview on their Facebook and Twitter pages. 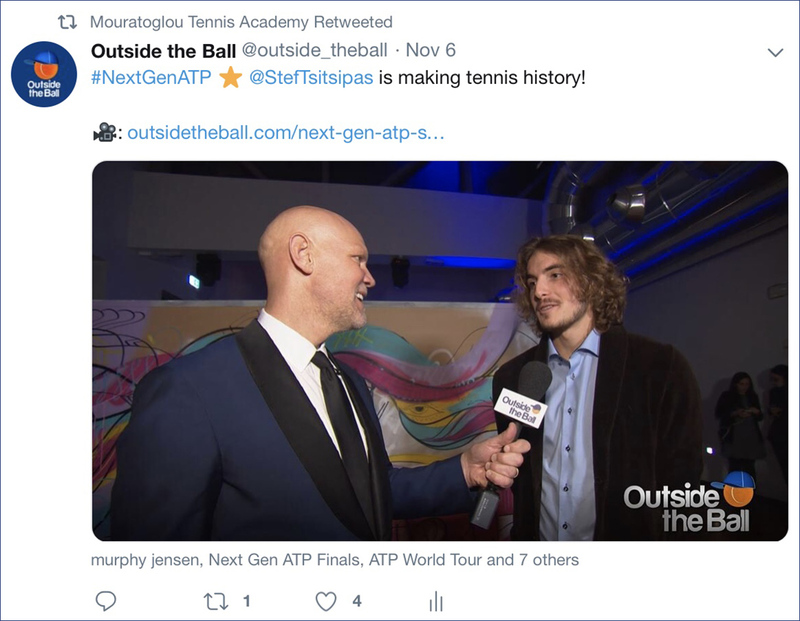 Murphy Jensen represented Outside the Ball at the ATP Next Gen Finals in Milan where he interviewed stars like Stefanos Tsitsipas, who would become champion of the event. 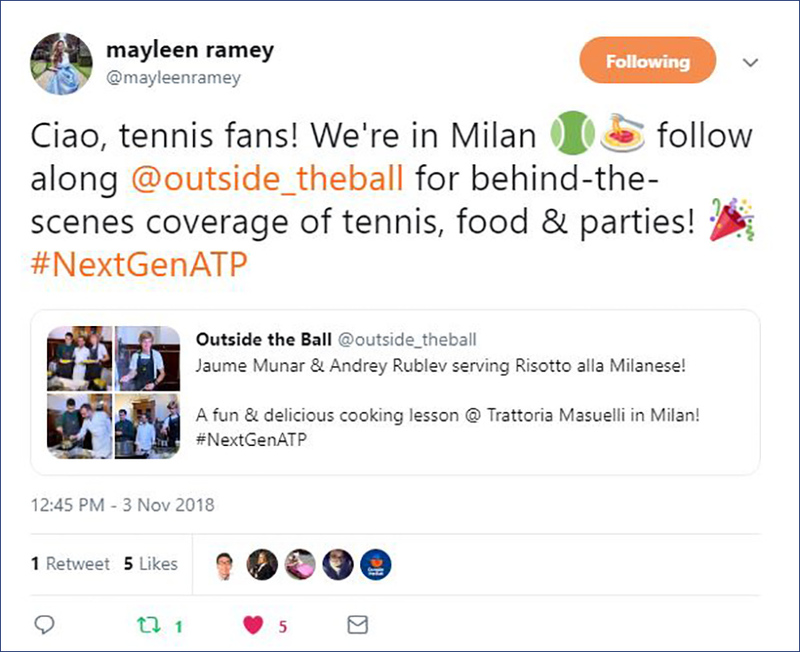 Outside the Ball traveled to Milan for the ATP Next Gen Finals. The team covered a delicious Italian cooking demo with Jaume Munar and Andrey Rublev and joined the pros for the tournament's draw party. 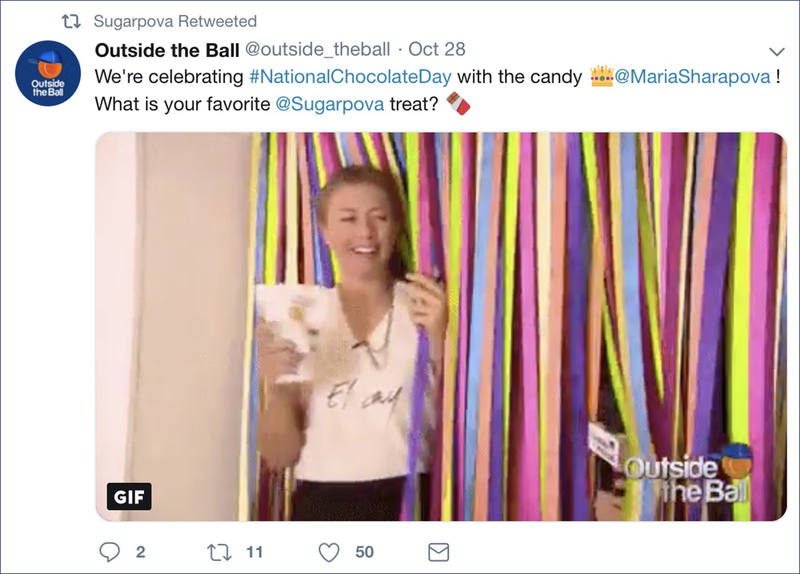 Outside the Ball celebrated National Chocolate Day by sharing a sweet gif from our interview with Sugarpova founder Maria Sharapova. 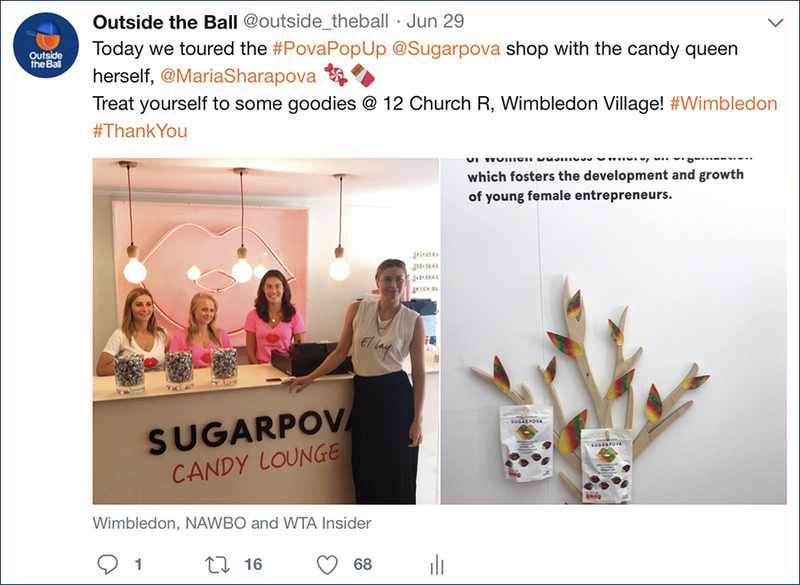 OTB host Mayleen Ramey got a tour of the Sugarpova Pop Up Shop during Wimbledon. The premiere candy company shared the post onto their Twitter account. 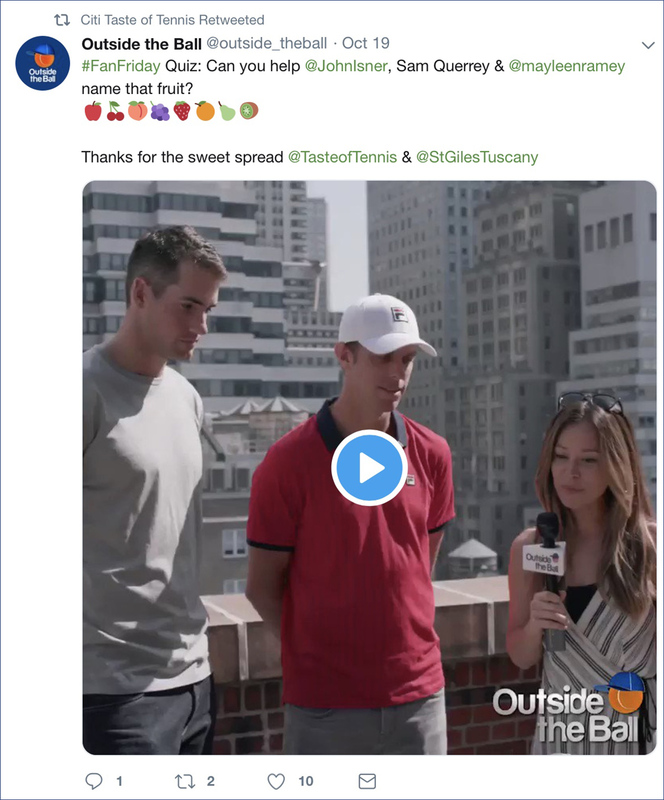 On the rooftop at the St Giles Tuscany hotel in NYC, Outside the Ball joined John Isner and Sam Querrey for breakfast by Citi Taste of Tennis. Host Mayleen Ramey quizzed the American pros on a platter of exotic fruits. 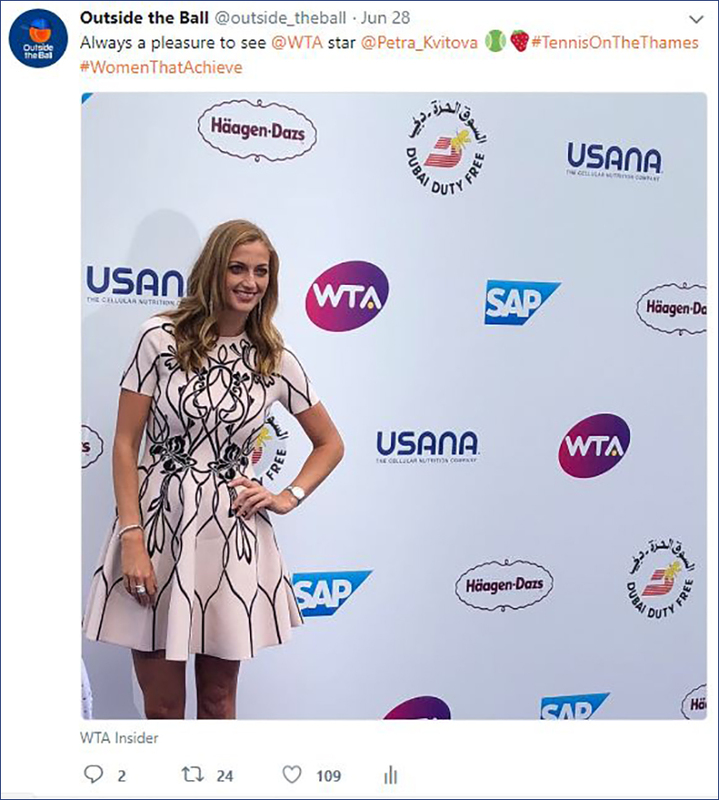 Citi Taste of Tennis shared our sweet teaser on Twitter. 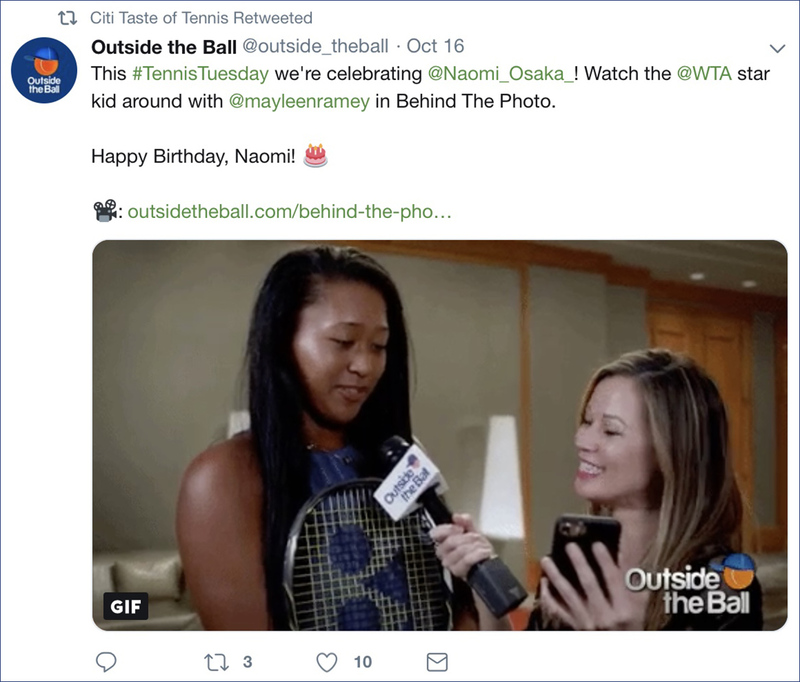 Outside the Ball shared a throwback interview with Naomi Osaka to celebrate her birthday. The Japanese star talked to Mayleen Ramey about the things she loved in her childhood and her social media use. 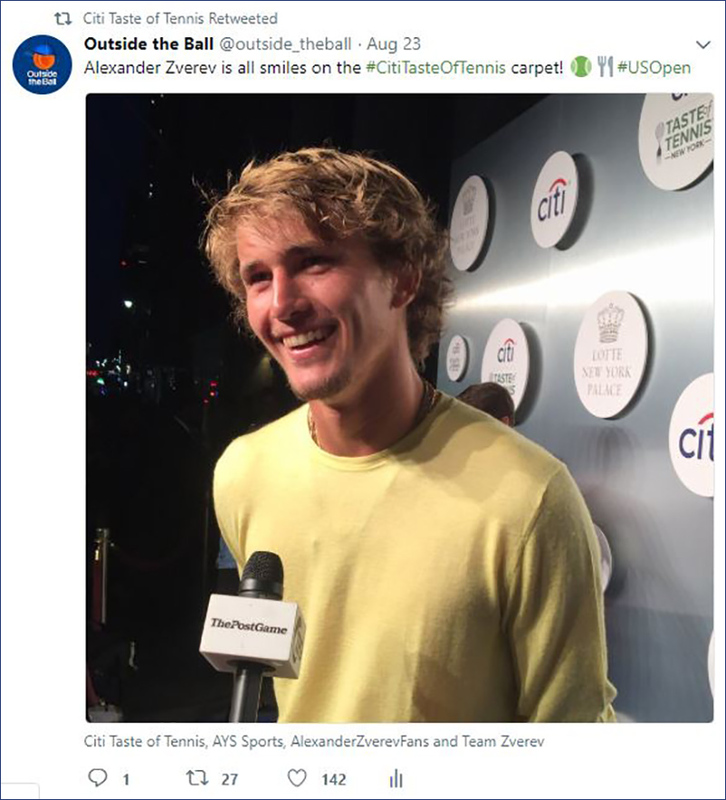 Citi Taste of Tennis re-tweeted the interview on their Twitter page. 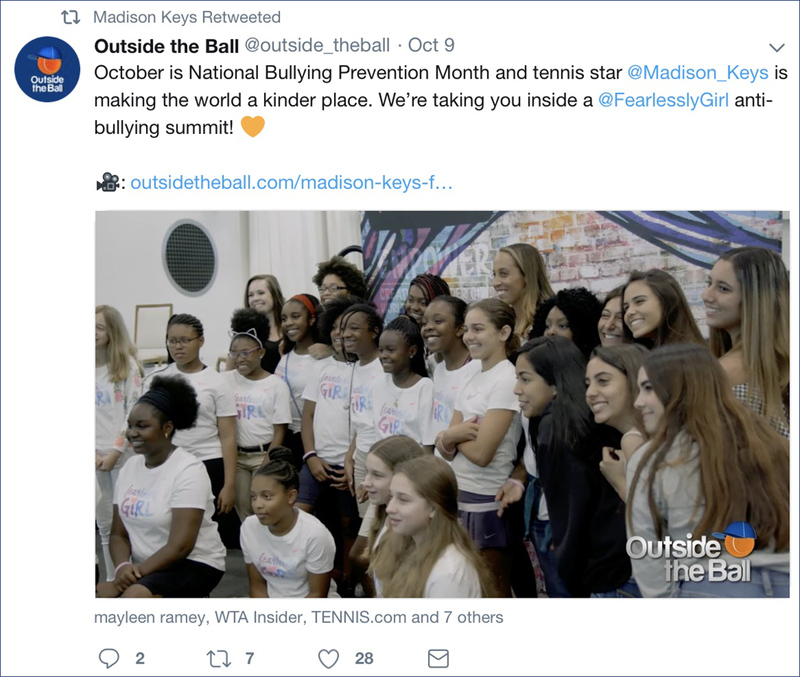 Outside the Ball took fans behind-the-scenes at a Fearlessly Girl summit where Madison Keys is helping young girls create a kinder world. Madison Keys shared our video on Twitter to honor Day of the Girl and National Bullying Prevention Month. The non-profit organization Play Like a Girl shared Outside the Ball's footage from a Fearlessly Girl summit with WTA star Madison Keys. 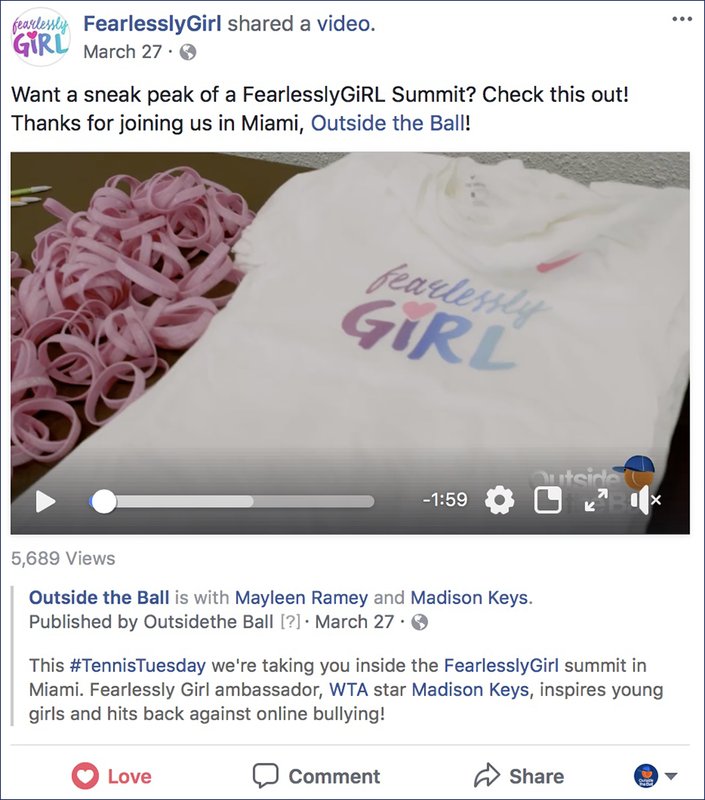 Like the anti-bullying organization Fearlessly Girl, Play Like a Girl is known for their work in helping young girls. 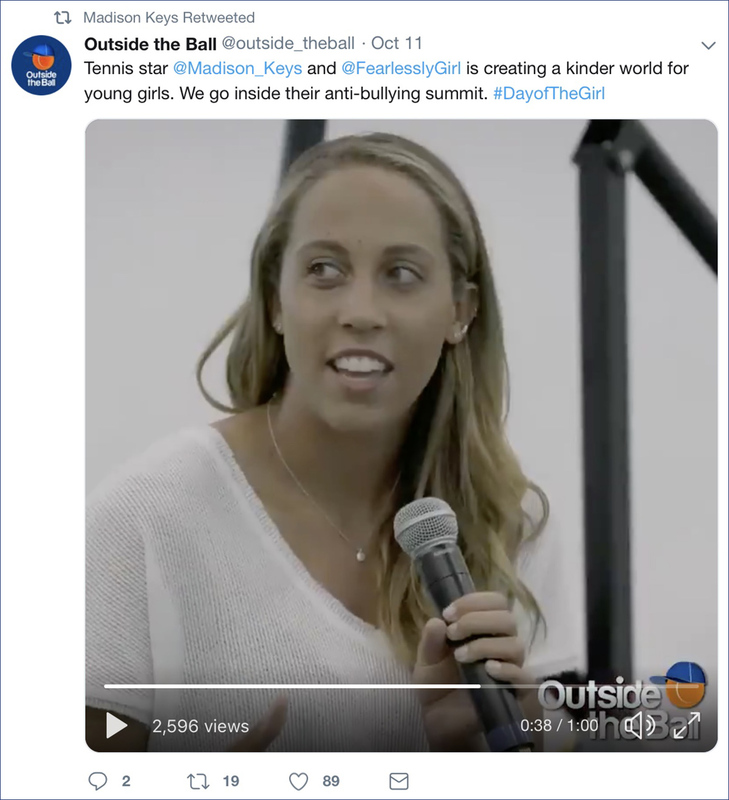 Play Like a Girl re-tweeted the video to celebrate both National Bullying Prevention Month and Day of the Girl. 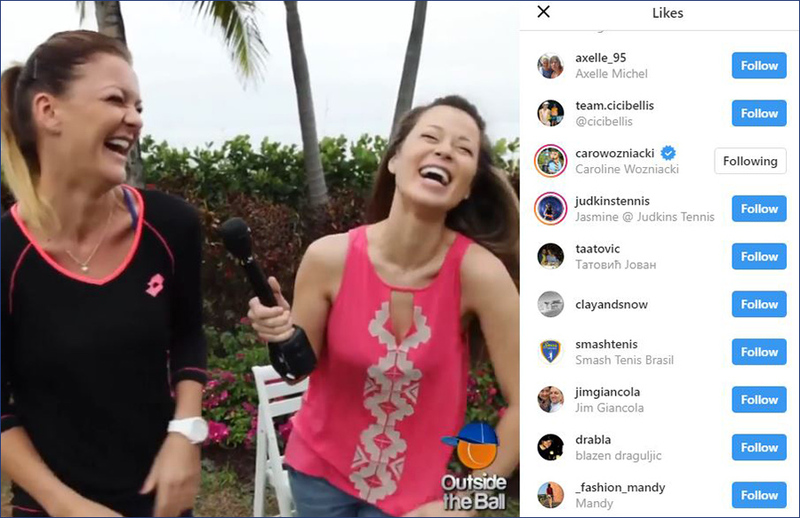 Outside the Ball's Instagram account includes original video and photo content as well as re-posts from the sports biggest stars and media affiliations. 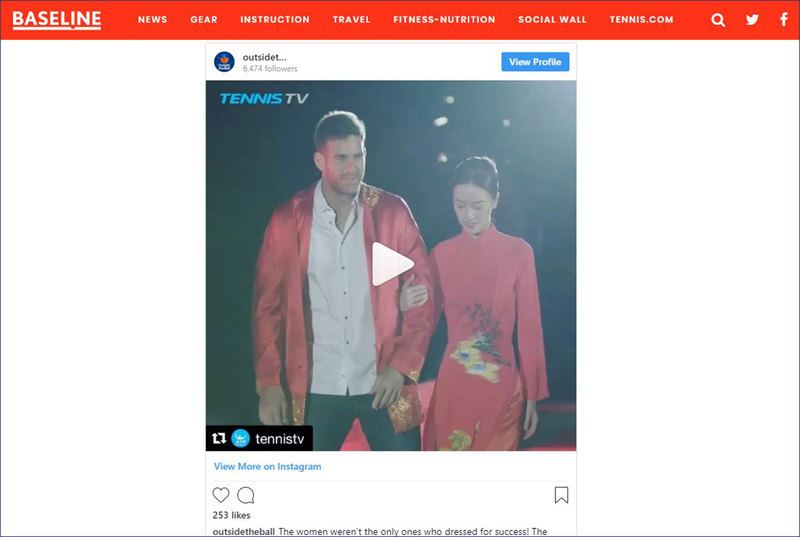 Tennis.com's Baseline featured one of our re-posted videos from Tennis TV in an article that took fans inside the Player Party in Beijing. American tennis star John Isner talks to host Mayleen Ramey about the birth of his daughter. 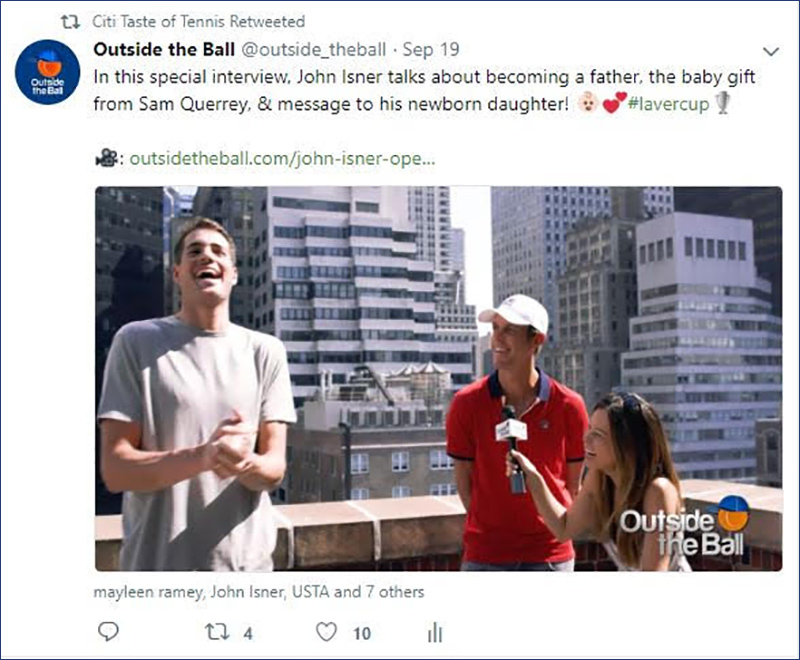 Citi Taste of Tennis joined in the baby celebration and retweeted the interview to their Twitter followers. 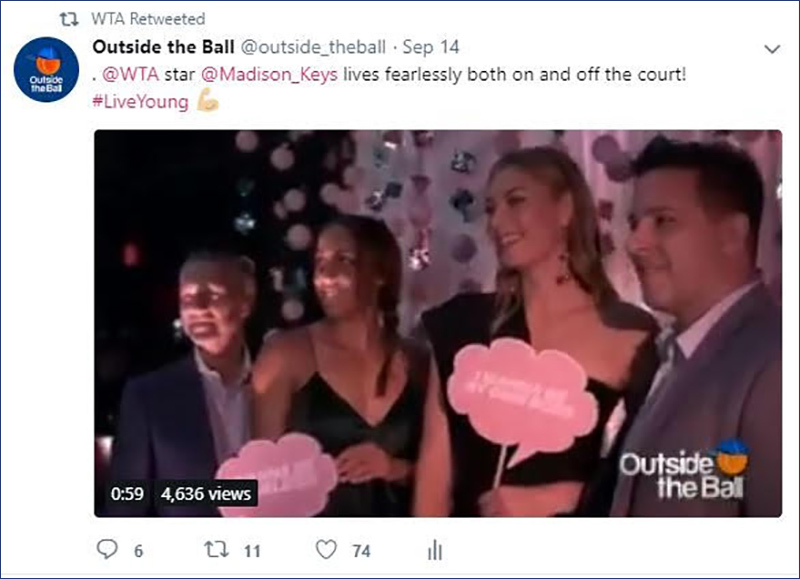 The WTA organization shared Outside the Ball's interview with Madison Keys to their Twitter followers. 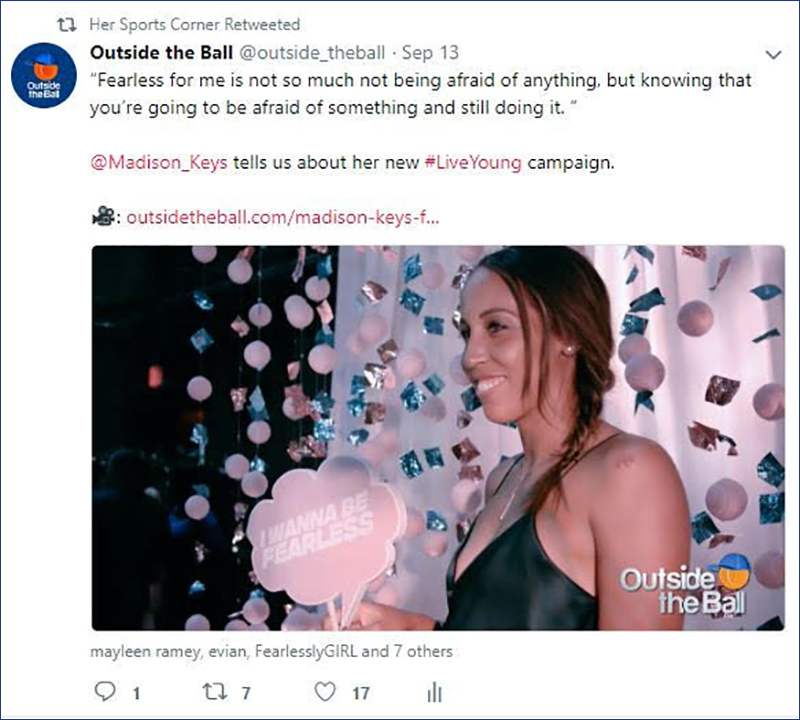 Outside the Ball joined Madison Keys at an Evian party to talk about her latest campaign. Madison spoke about her goal to be fearless both on and off the court and her work to inspire young girls. 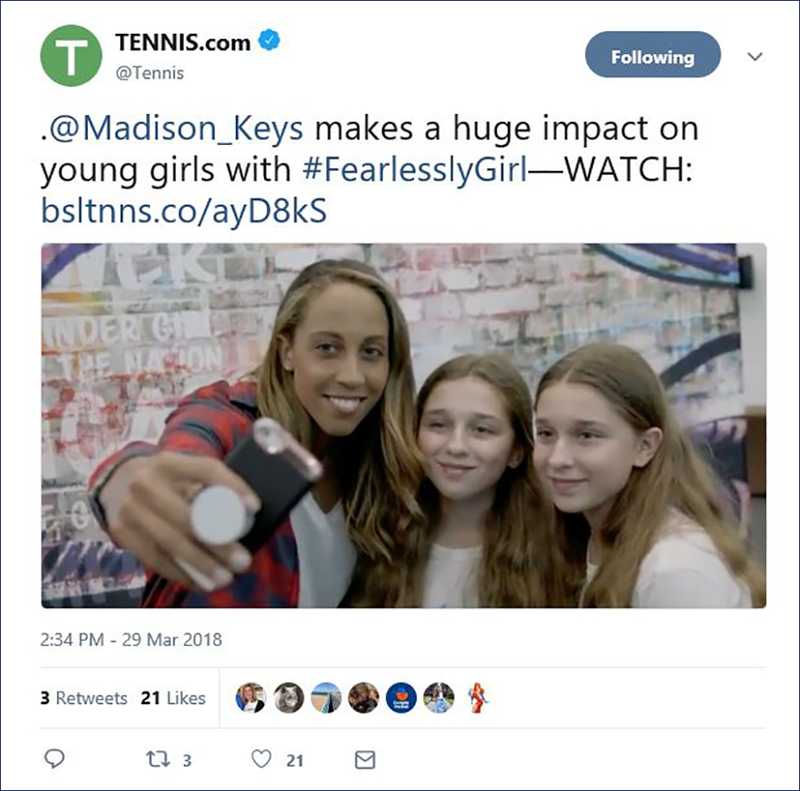 The interview was a hit with retweets from Her Sports Corner, Tennis Atlantic, and the anti-bullying organization FearlesslyGirl. 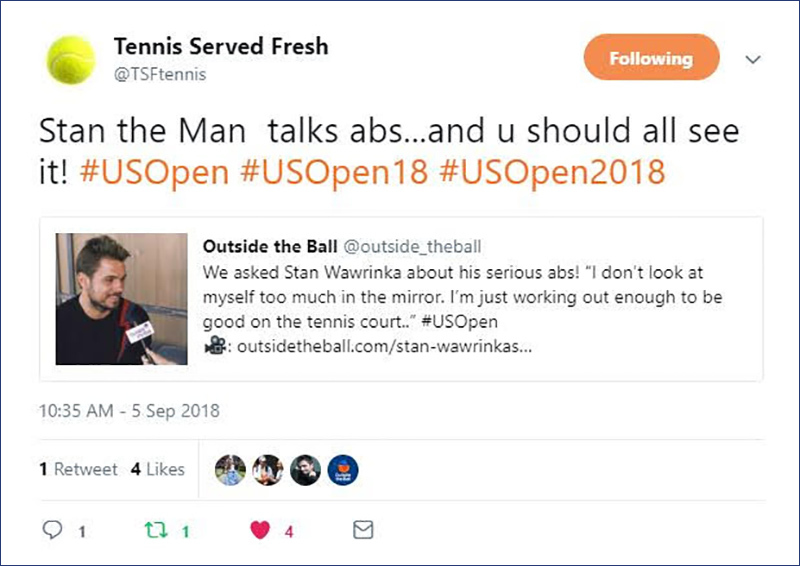 Tennis Served Fresh retweeted Outside the Ball's interview with Stan Wawrinka. The Swiss tennis star talked about his fitness that gained him abs that could break the internet. 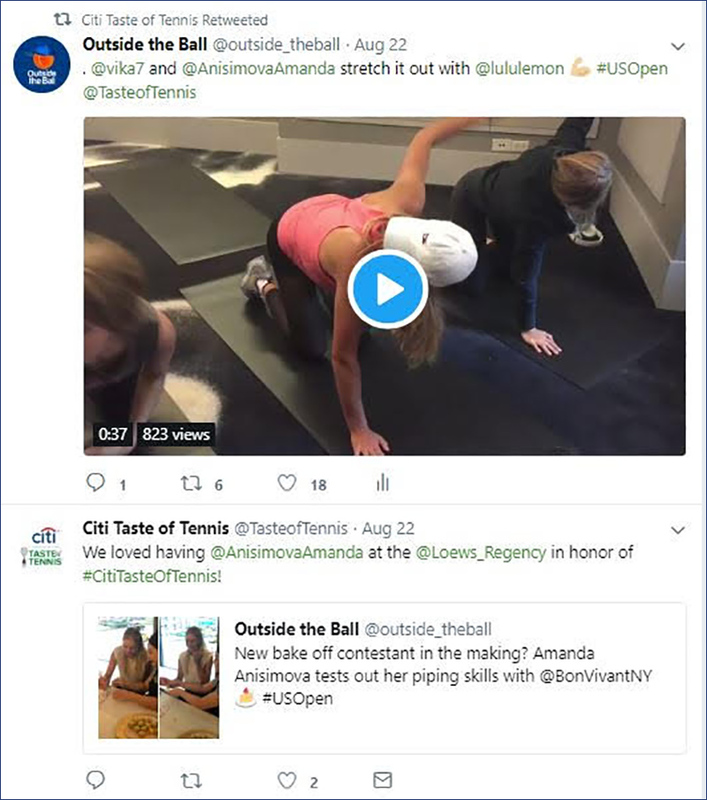 Tennis Served Fresh published our interview with Victoria Azarenka and US Open wildcard Amanda Anisimova onto their website, and shared the video with their Twitter followers. 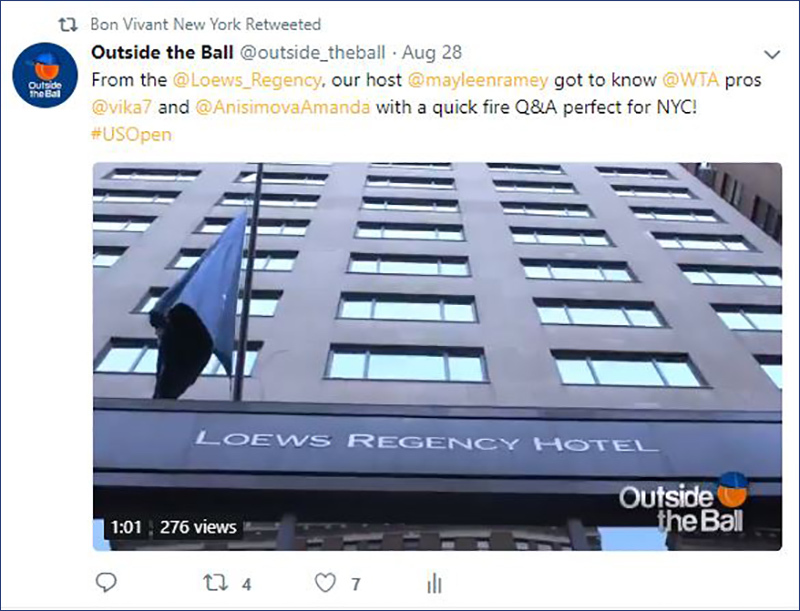 The fast paced Q&A got to know the tennis stars in a New York Minute. 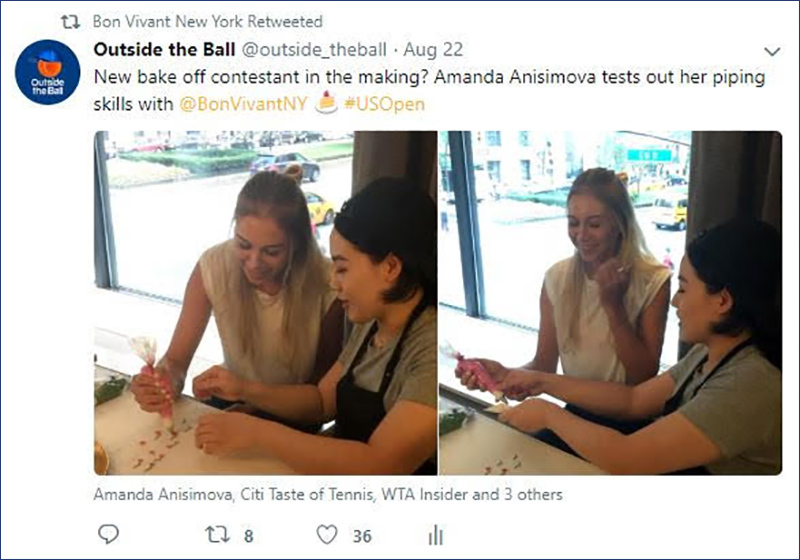 The New York City cake cafe, Bon Vivant NY, retweeted our interview with Victoria Azarenka and Amanda Anisimova to their Twitter followers. 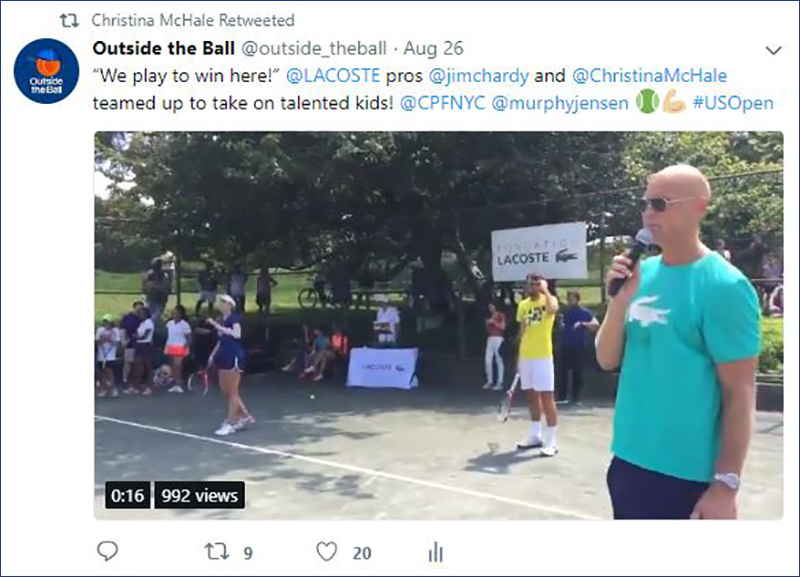 For the second year, Outside the Ball joined Lacoste and the City Parks Foundation for their free tennis clinic in Central Park. 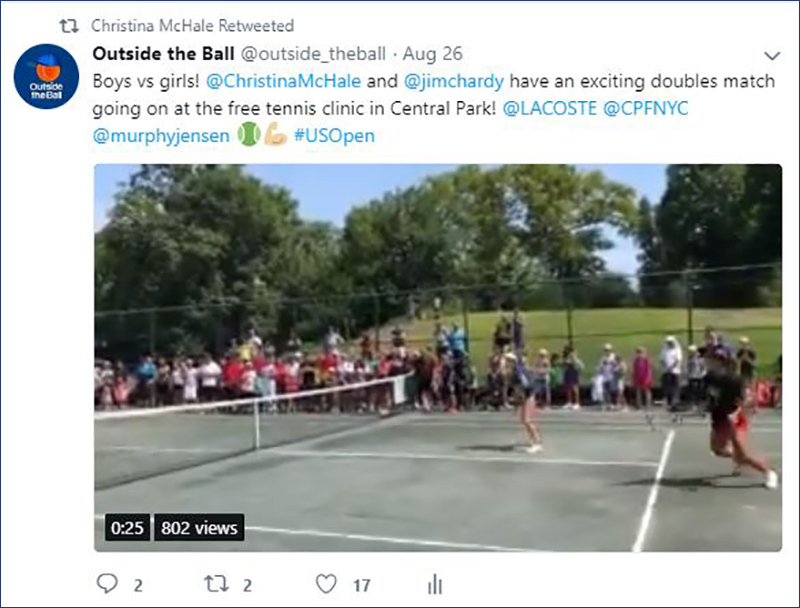 American tennis pro Christina McHale retweeted our live coverage of the event to her Twitter followers. 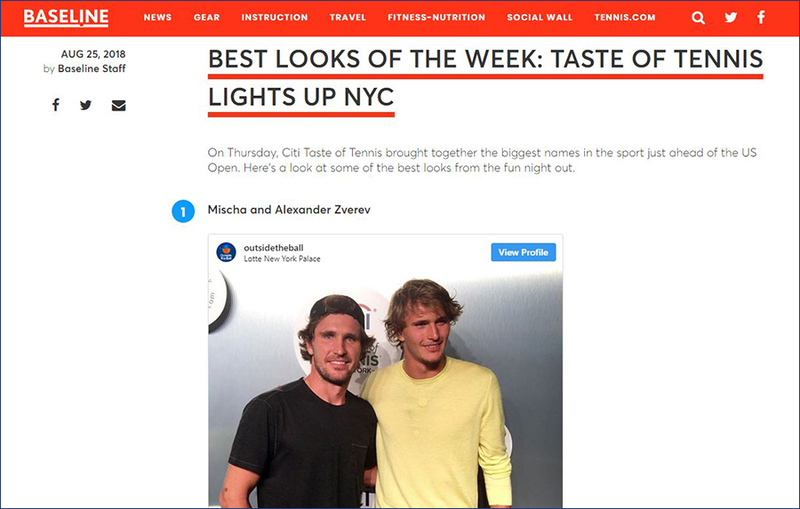 Baseline published another article on this year's Citi Taste of Tennis from New York City. 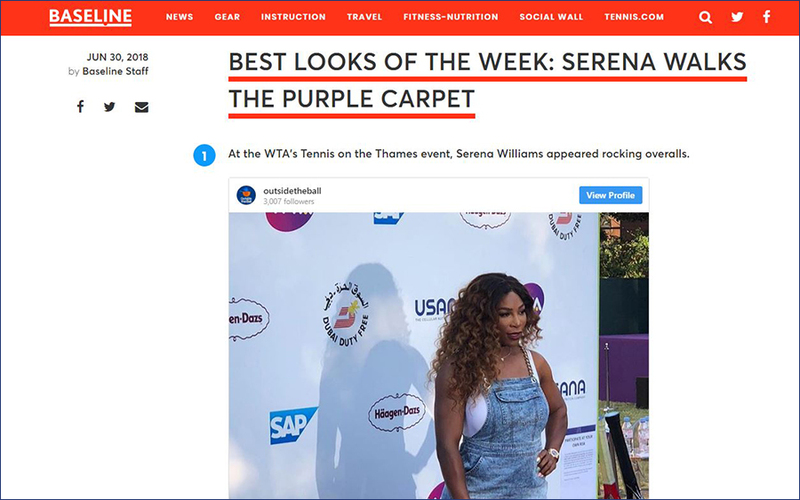 In rounding out the best looks of the night, Baseline included our photos of Alexander and Mischa Zverev, Sloane Stephens and Nick Kyrgios. At the Loews Regency hotel, Outside the Ball interviewed American up and comer Amanda Anisimova. The US Open wildcard shared this photo with our host Mayleen Ramey on her Instagram account. Lacoste held an autograph session with Novak Djokovic at Macy's and Outside the Ball was in attendance. Before the meet & greet began, Novak had fun posing for the press. After the event, Novak shared pictures onto his Instagram account which included one of our popular photos. Outside the Ball covered US Open media day, where the top ATP & WTA players spoke to the press ahead of the US Open. 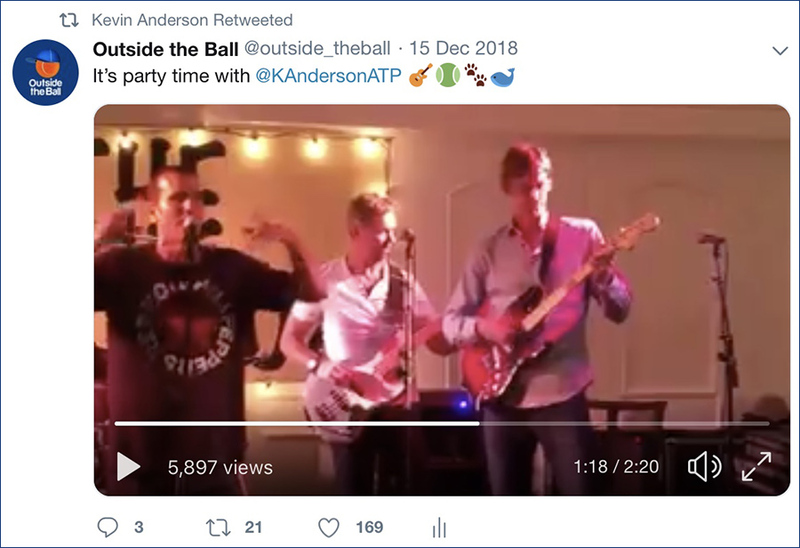 Our live coverage was popular with fans, and got a retweet from tennis star Kevin Anderson. 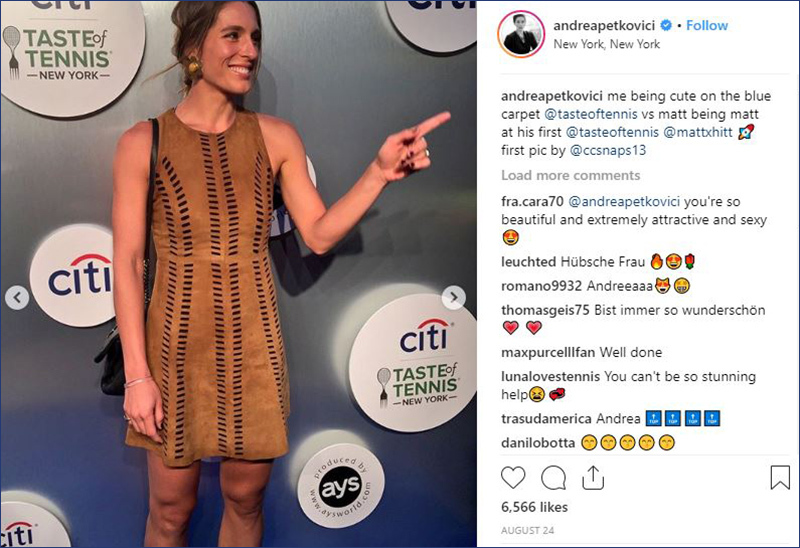 Fashionista tennis star Andrea Petkovic is a red carpet favorite, and the Citi Taste of Tennis party was no exception. Outside the Ball snapped her latest look on the carpet and Andrea shared one of our photos with her Instagram followers. Tennis.com's Baseline took their viewers inside the Citi Taste of Tennis party with Outside the Ball's coverage from the carpet. 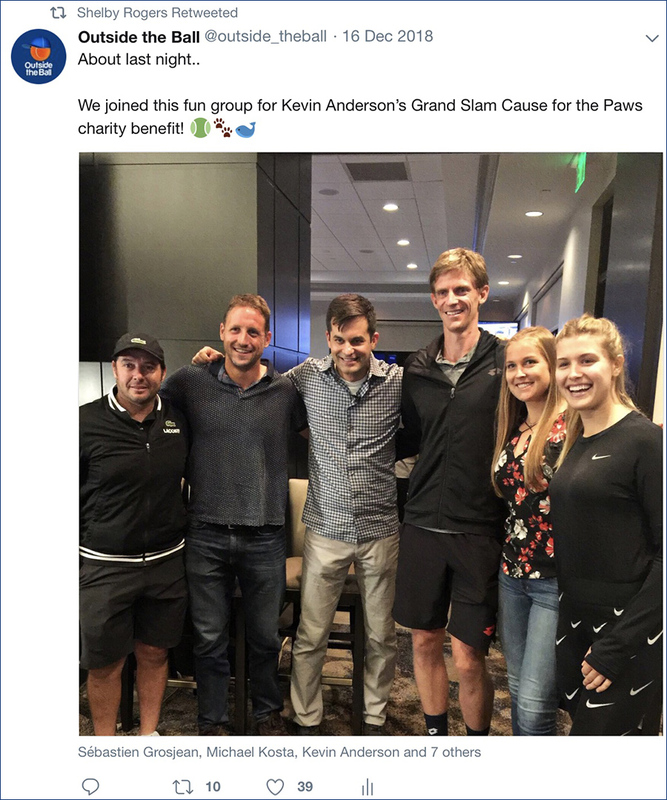 The article included our photos of Alexander and Mischa Zverev, Sloane Stephens, and Nick Kyrgios. 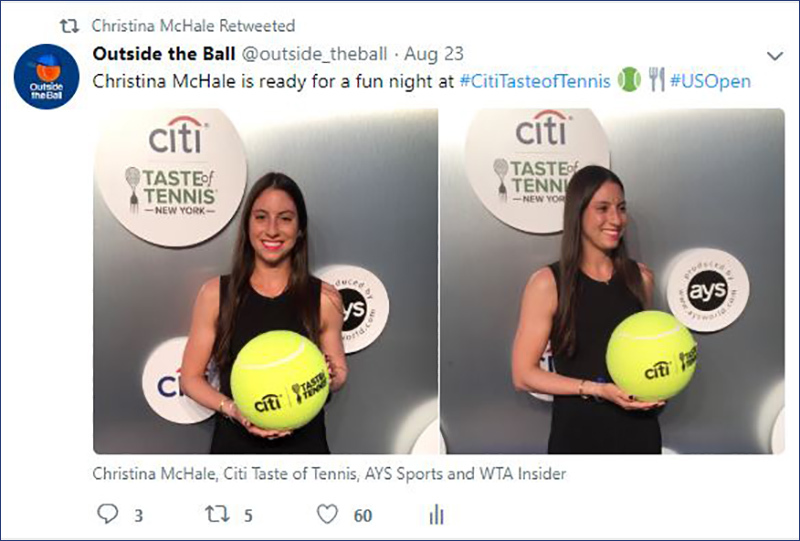 Tennis pro Christina McHale retweeted Outside the Ball's live coverage from the Citi Taste of Tennis party. 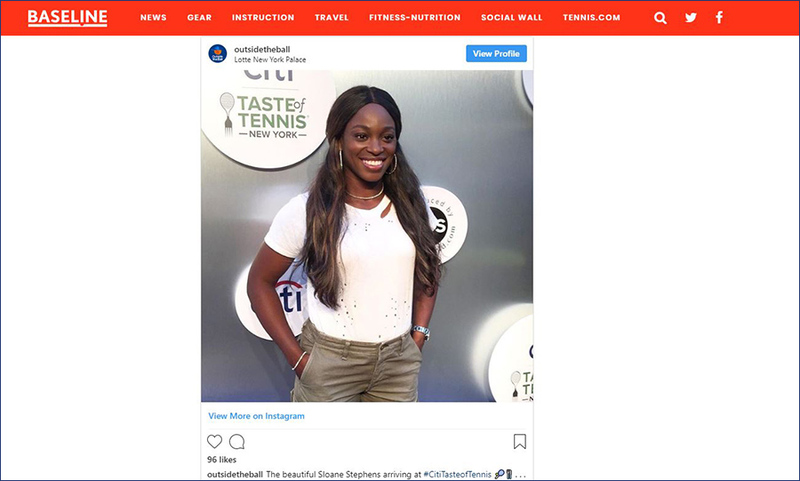 The Citi Taste of Tennis party in New York City continued their success in combining tennis stars with culinary legends. 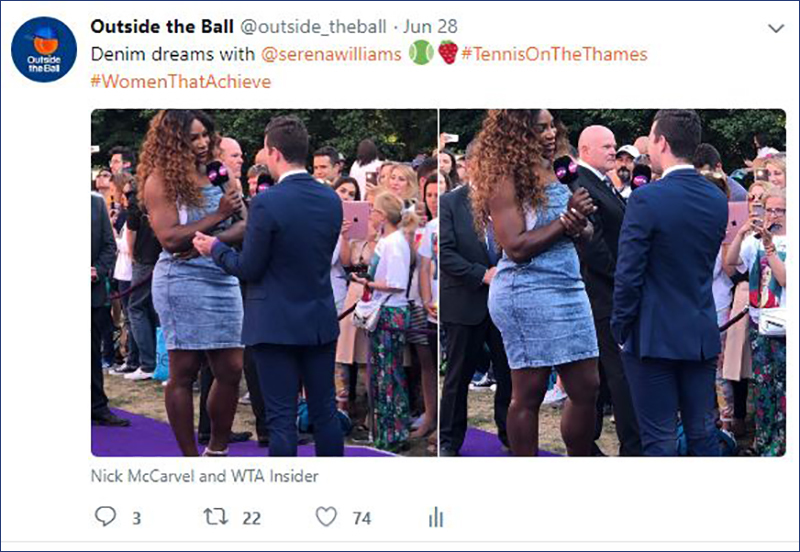 The delicious event shared Outside the Ball's live coverage with their Twitter followers. Serena Williams, Simona Halep, Alexander Zverev, Nick Kyrgios, Elina Svitolina, and Andrea Petkovic were the featured players. 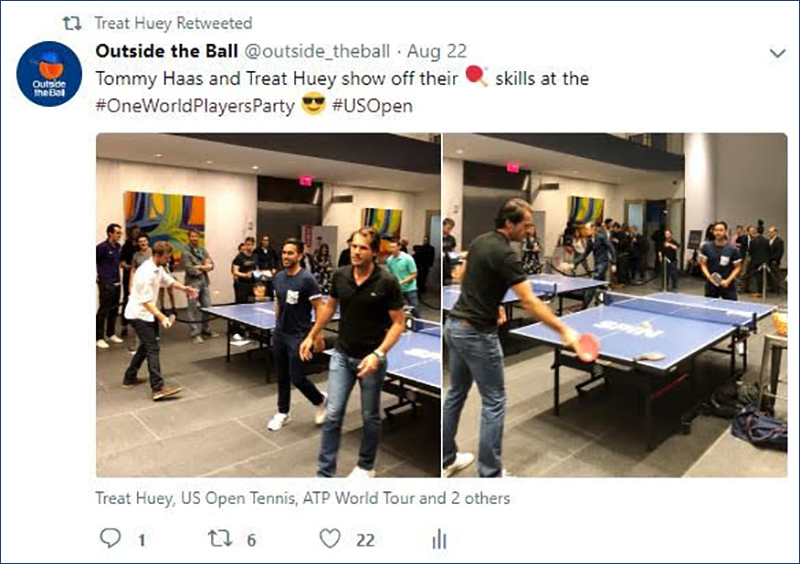 Tennis player Treat Huey played against Tommy Haas at the One World Players Party. 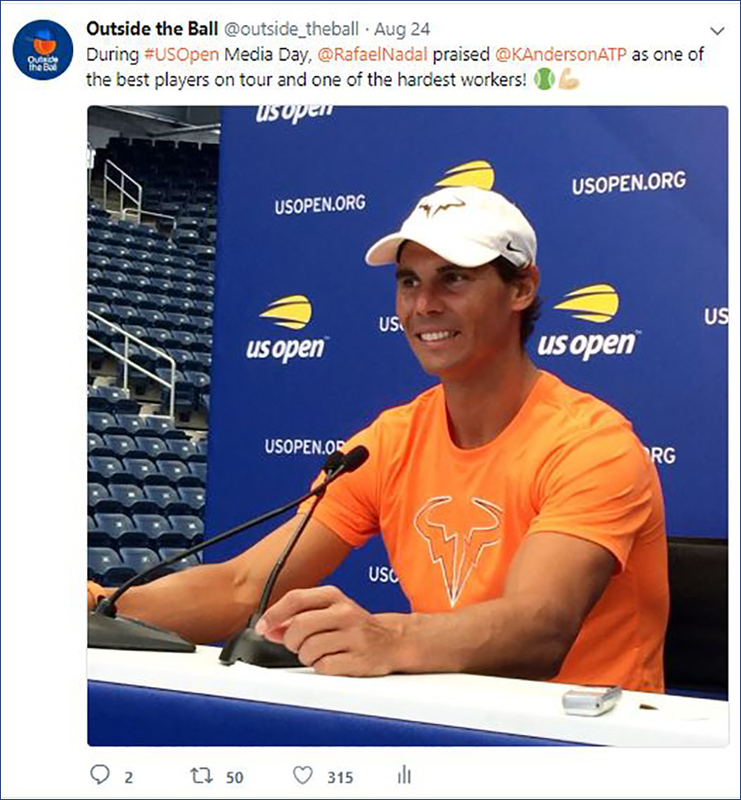 He shared our live coverage of the match to his Twitter followers. Outside the Ball was in attendance of the One World Players Party in New York City. The party had the pros squaring off in a ping pong competition. 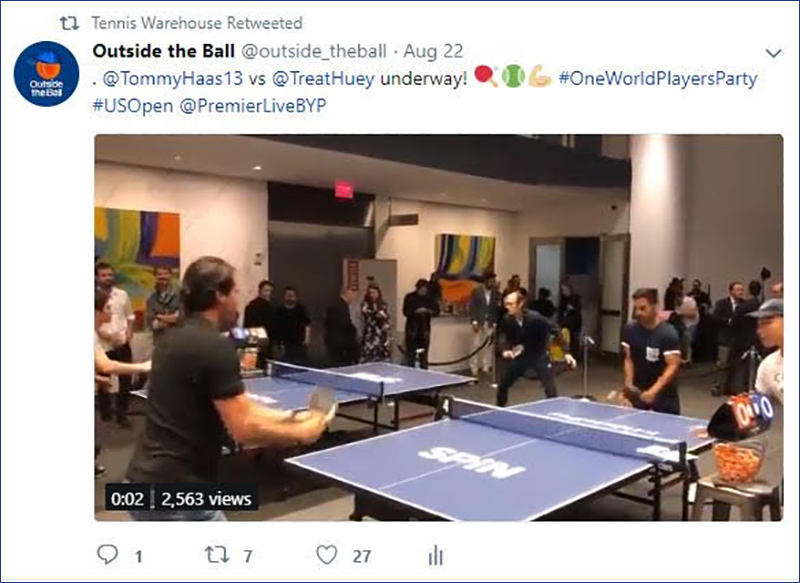 Tennis Warehouse shared our video of Tommy Haas and Treat Huey with their Twitter followers. The embedded video received 2,564+ views. 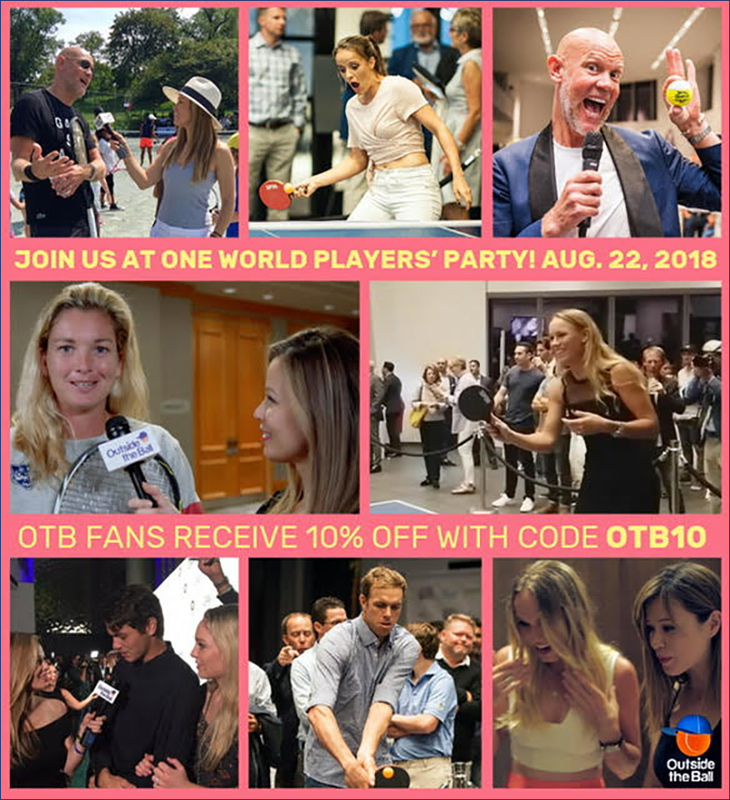 Fans of Outside the Ball were able to get 10% off tickets for the One World Player's Party in New York City and get a chance to see the pros like never before. Bon Vivant NY gave American Amanda Anisimova a lesson in piping. Outside the Ball captured the cake decorating and the New York cake cafe shared the photos on their Twitter account. Outside the Ball attended a Citi Taste of Tennis event at the Loews Regency hotel. Tennis players Victoria Azarenka and Amanda Anisimova participated in cake decorating and yoga demonstrations. 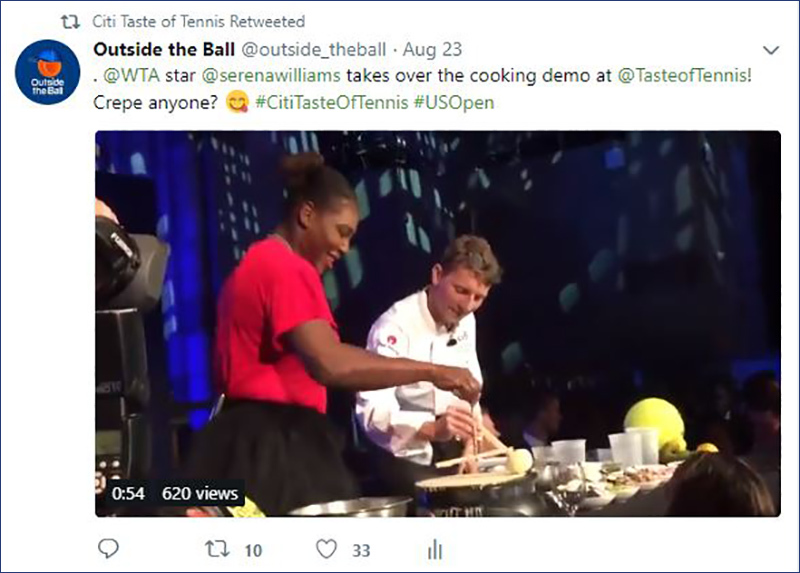 Citi Taste of Tennis shared our coverage of the event to their Twitter followers. 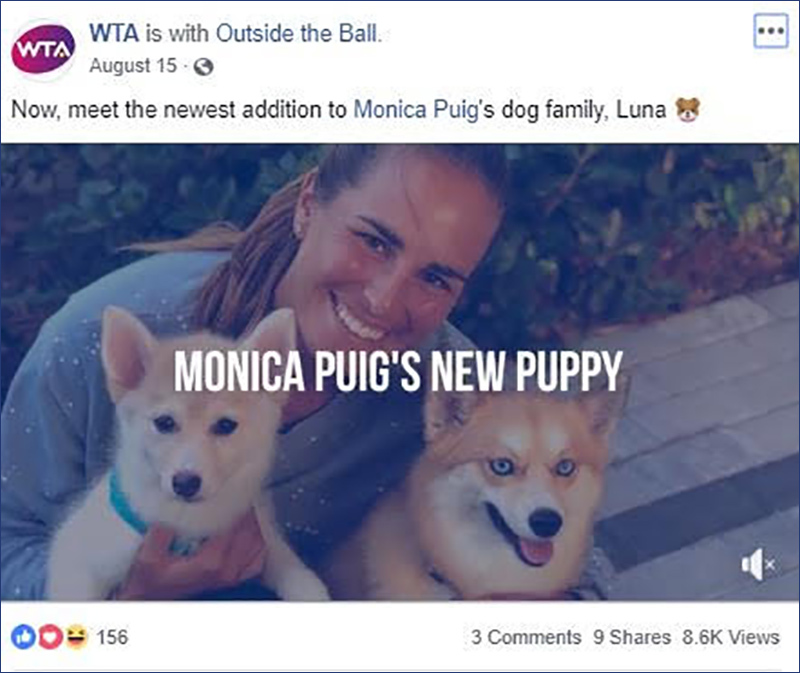 Outside the Ball's interview with Monica Puig was not only a hit with the player herself, but the WTA organization shared the video to their Facebook followers. 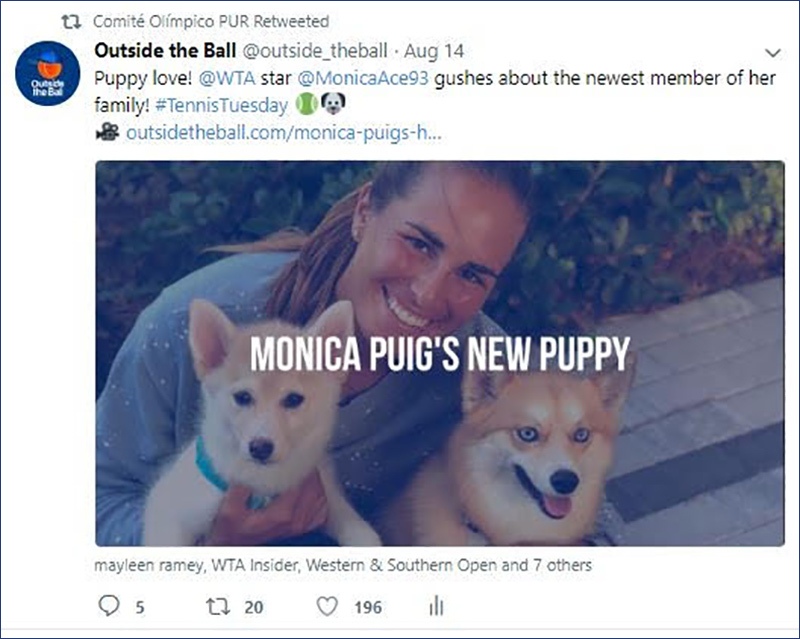 The Puerto Rico Olympic committee retweeted Outside the Ball’s interview with Olympic gold medalist Monica Puig. 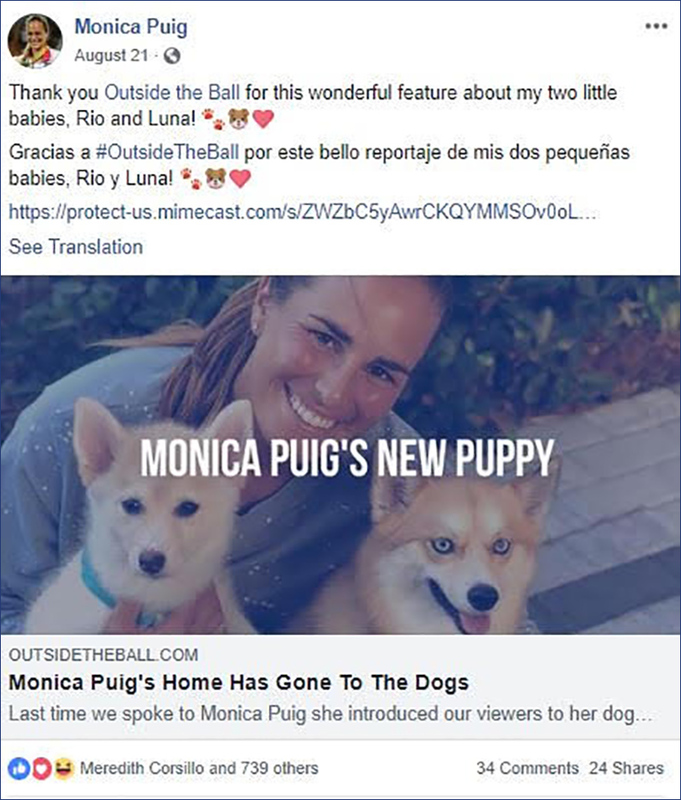 Outside the Ball interviewed Monica Puig about her new puppy Luna. 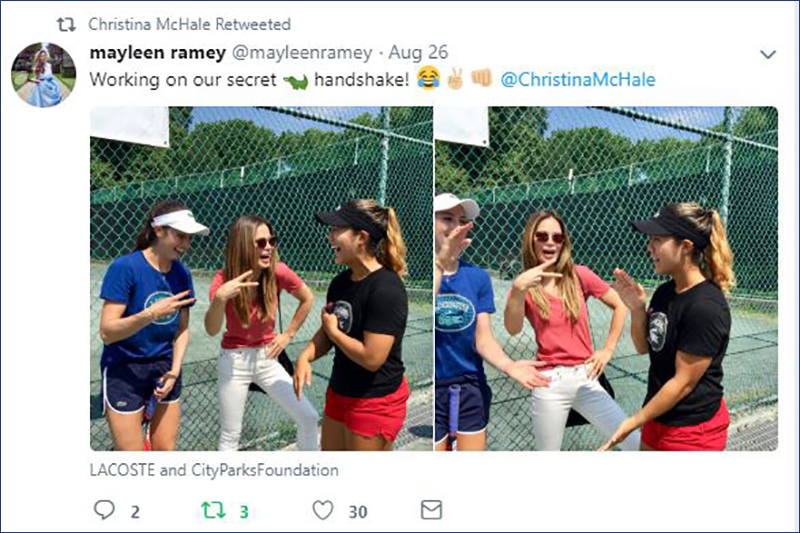 The tennis star loved the video featuring her furry family and shared the interview to her fans on Twitter, Instagram and Facebook. 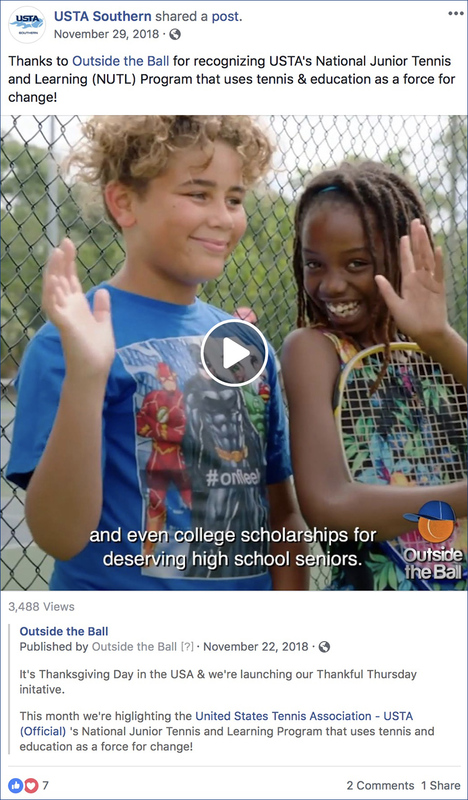 Outside the Ball released a special Fan Friday video of Heather Watson. The WTA player described her collaboration with a London fashion designer. 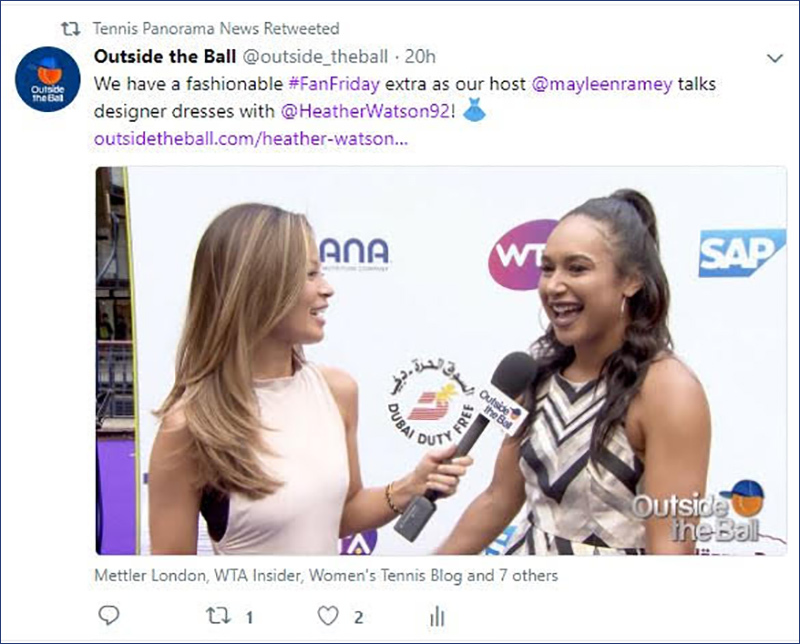 Tennis Panorama News retweeted the interview to their Twitter followers. Before Karolina Pliskova and Michal Hrdlicka walked down the aisle this month, they opened up to us about their relationship. 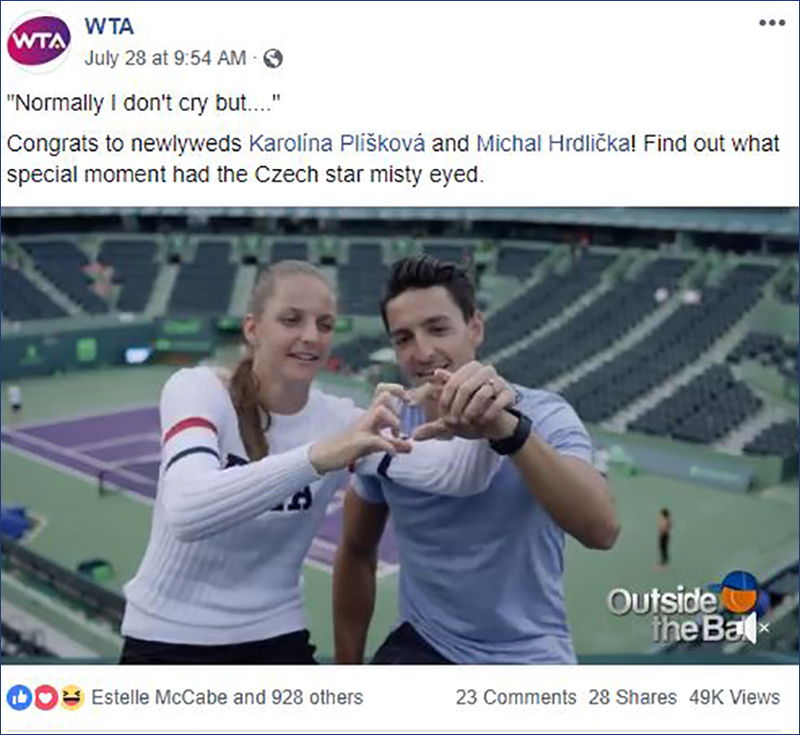 The official WTA Facebook account shared the video and gathered over 49 thousand views. 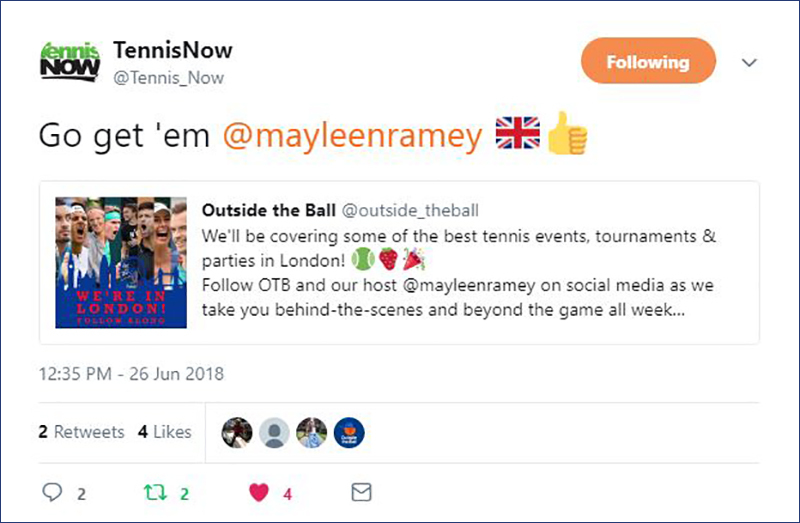 Mayleen Ramey interviewed the stars as they arrived for Tennis on the Thames. 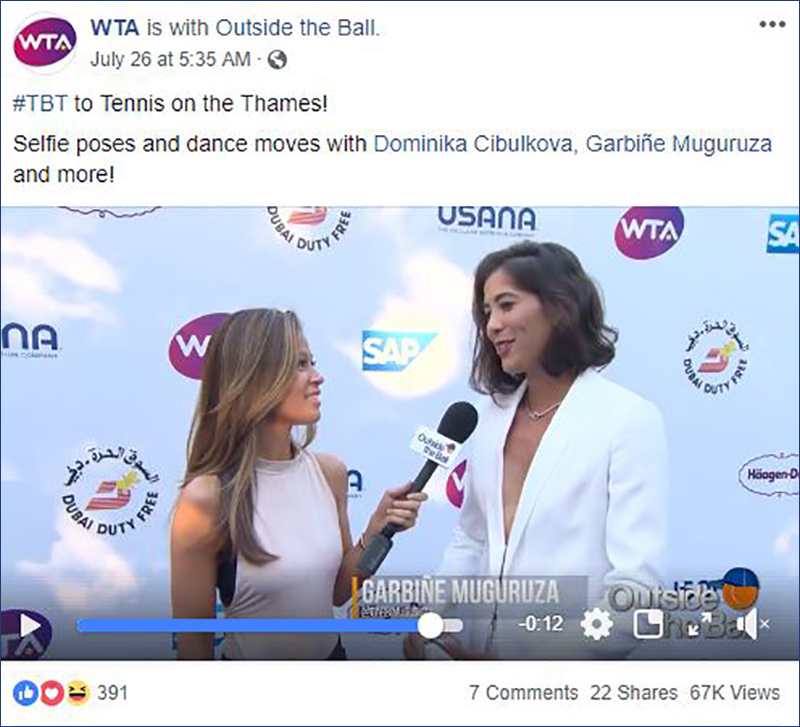 The official WTA Facebook account shared our behind-the-scenes video and gained over 67 thousand views. Tennis player Naomi Broady talked to host Mayleen Ramey about her friendship with fellow pro, Heather Watson, while on the WTA Tennis on the Thames purple carpet. Naomi shared the interview with her Twitter followers. British freelance blogger Chris Goldsmith also shared the video. 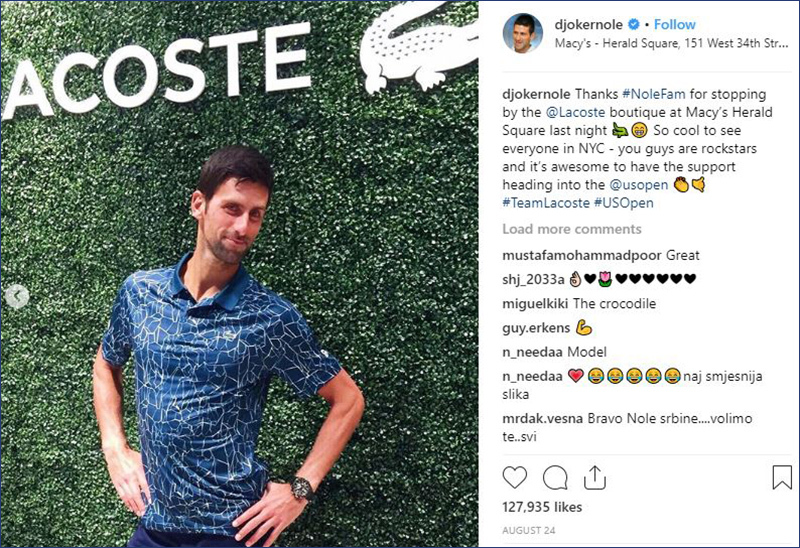 Wimbledon Champion Novak Djokovic previously joined Outside the Ball host Mayleen Ramey for a funny improv exercise that showed off his acting skills. Serbia's sports website Svet Plus shared the interview to their Twitter followers and featured the video on their website. 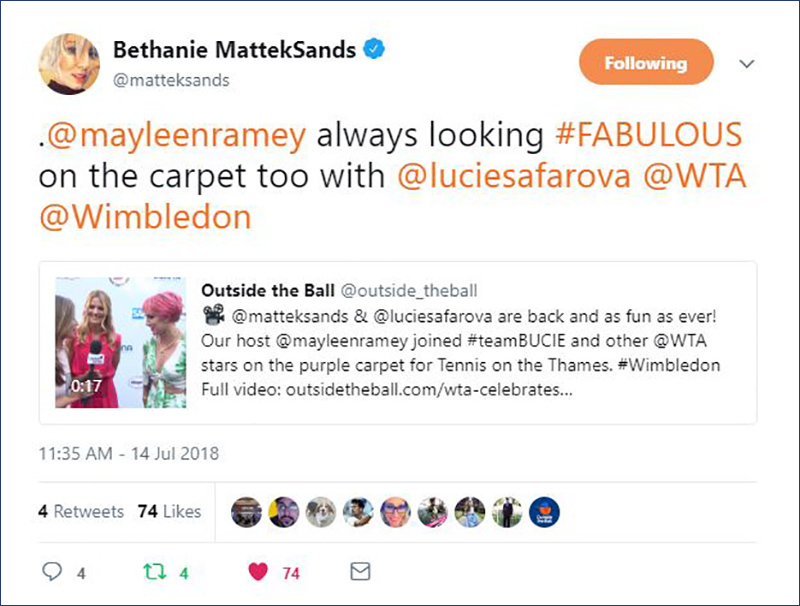 Bethanie Mattek-Sands and doubles partner Lucie Safarova are back together and joined Mayleen Ramey on the WTA Tennis on the Thames purple carpet. 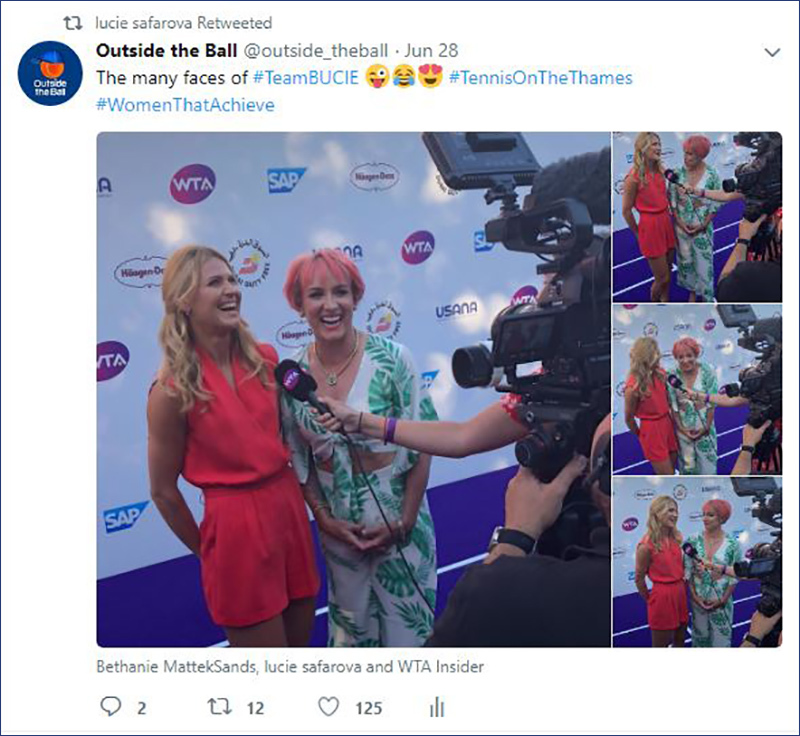 Mattek-Sands shared the video to her Twitter followers. Host Mayleen Ramey met Chris Fava, known for his elaborate handmade costumes with a tennis twist. This year Chris took the internet by storm when he debuted TrophyMan at Wimbledon. GrandSlam Tennis Tours captured Mayleen escorting TrophyMan around the grounds and stopping for photos. 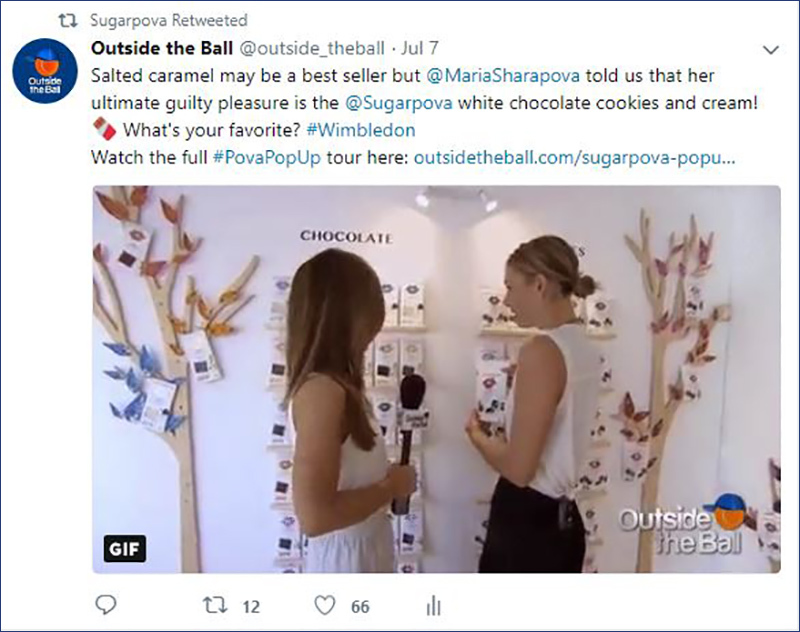 Outside the Ball's sweet behind-the-scenes tour of the Sugarpova Pop-Up shop with Maria Sharapova had people talking and snacking. 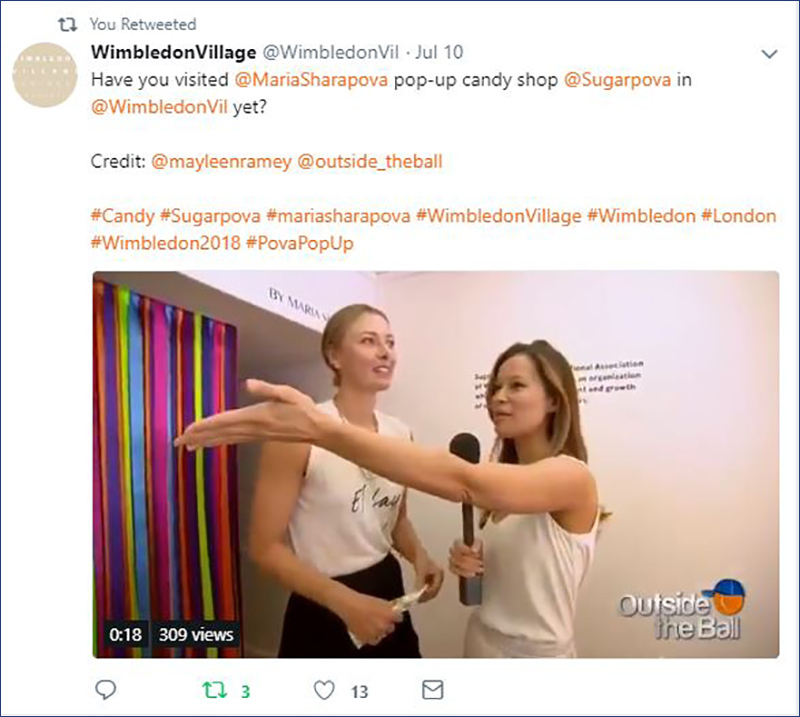 The Wimbledon Village, Sugarpova, and former tennis pro Murphy Jensen shared the video to their social media followers. 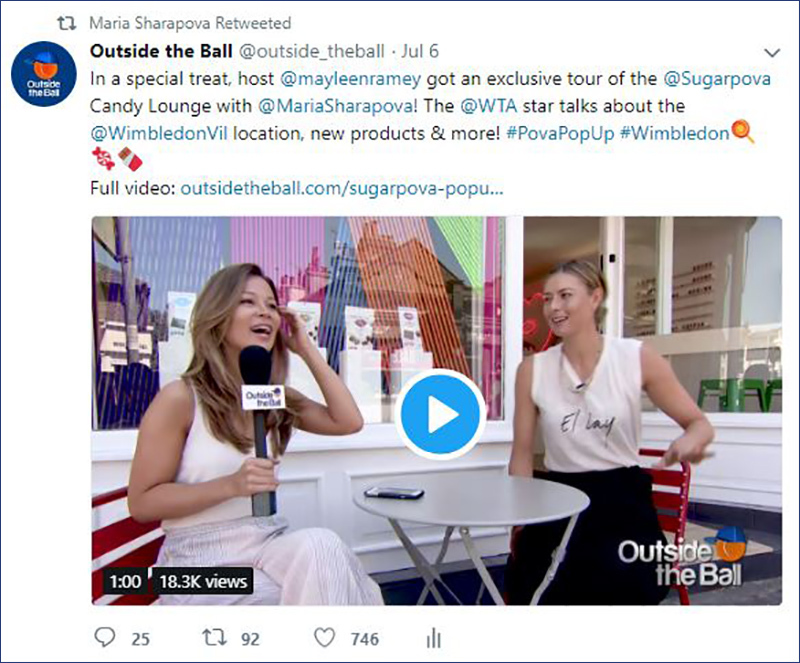 Outside the Ball had an exclusive tour of the Sugarpova Pop-Up shop with Maria Sharapova. 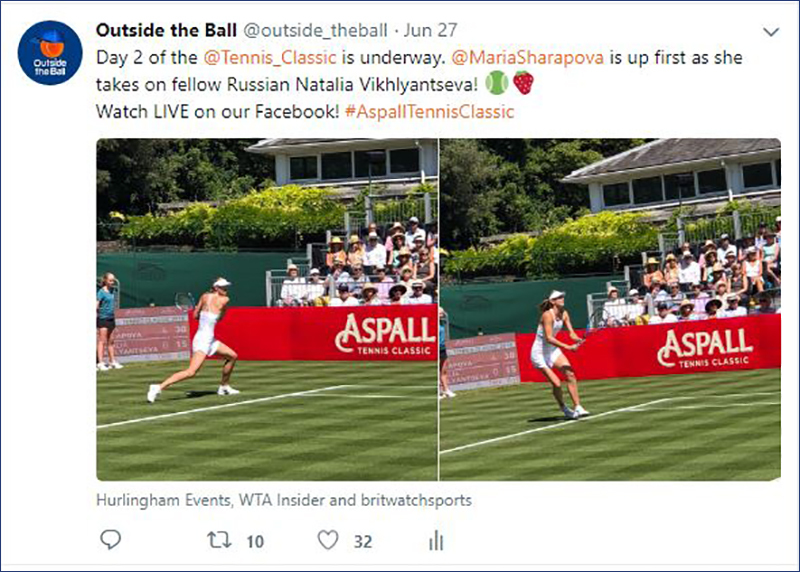 Maria featured our video on her official website and shared the video with her Twitter followers that received over 18 thousand views in one Tweet. 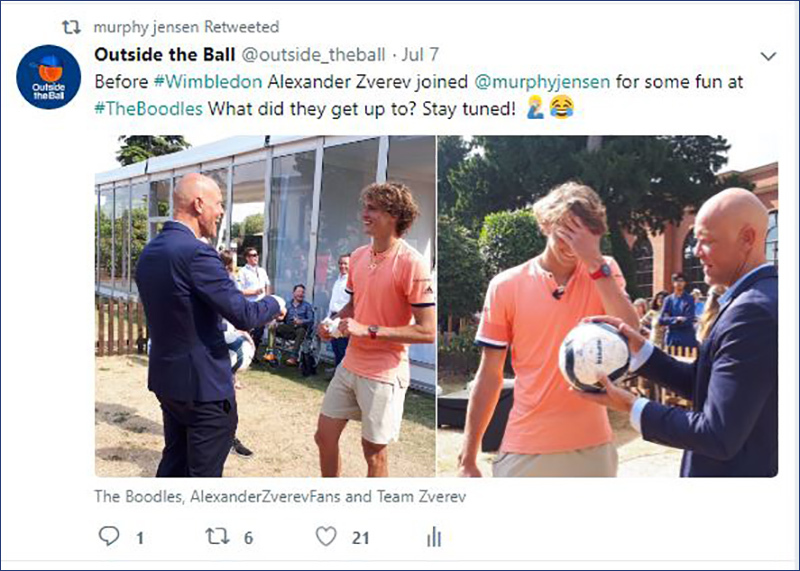 Outside the Ball's special correspondent Murphy Jensen had World Cup fever with tennis stars at the Boodles. Murphy shared this moment with Alexander Zverev to his Twitter followers. 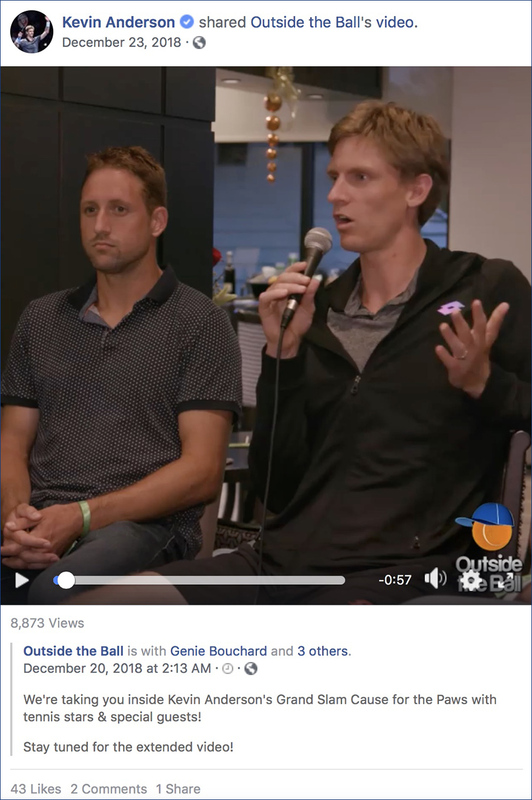 For the second year, Outside the Ball launched the Summer of Love initiative encouraging fans to donate to the USTA and The Tennis Foundation. 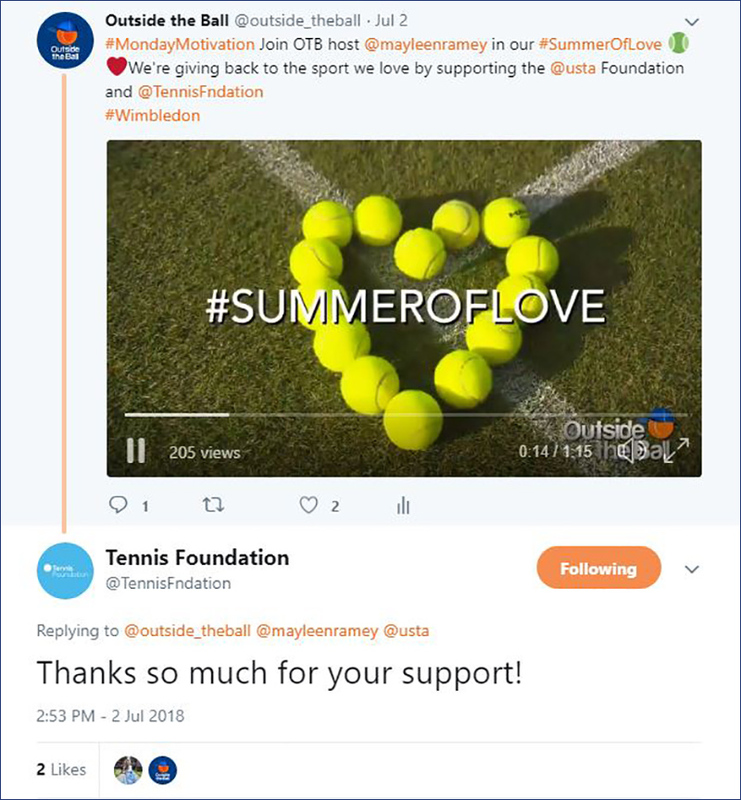 Great Britain's The Tennis Foundation sent their appreciation. Outside the Ball's live coverage from the WTA Tennis on the Thames purple carpet was featured on Tennis.com's Baseline. Outside the Ball got an exclusive tour of the Sugarpova Pop-Up shop with Maria Sharapova. The Candy Lounge was located in the Wimbledon Village and remained for the duration of the Wimbledon Championships. 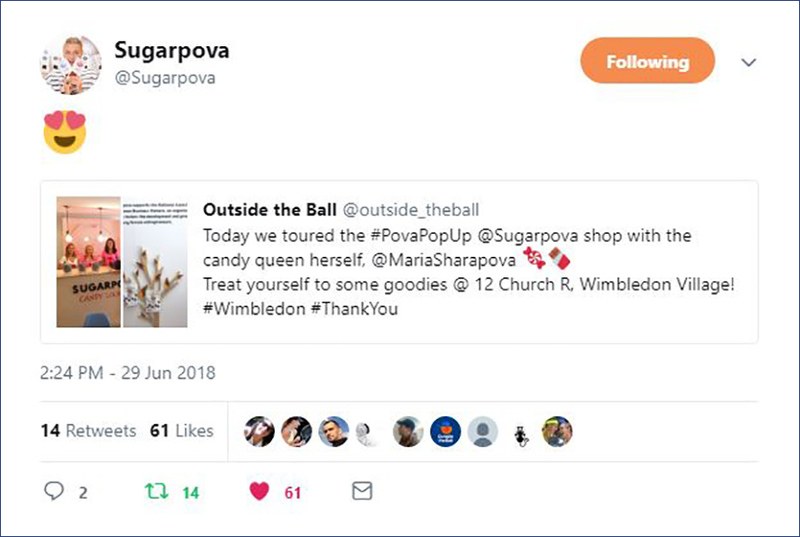 Sugarpova and the Wimbledon Village shared our tweet to their Twitter followers. 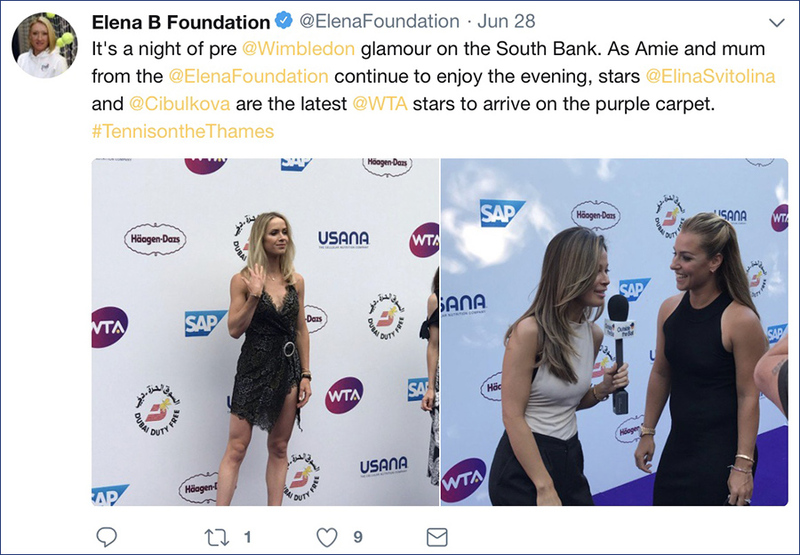 The Elena Foundation captured Mayleen Ramey interviewing Dominika Cibulkova at Tennis on the Thames. 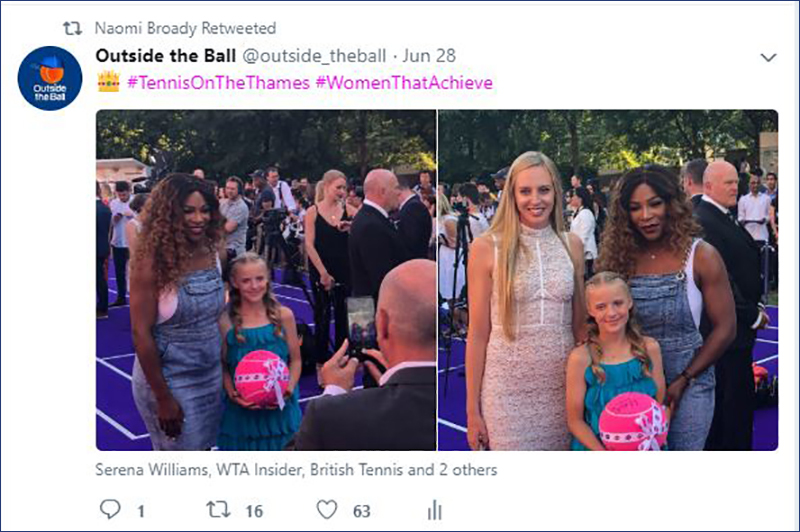 Outside the Ball shared live photos from the WTA Tennis on the Thames on social media. 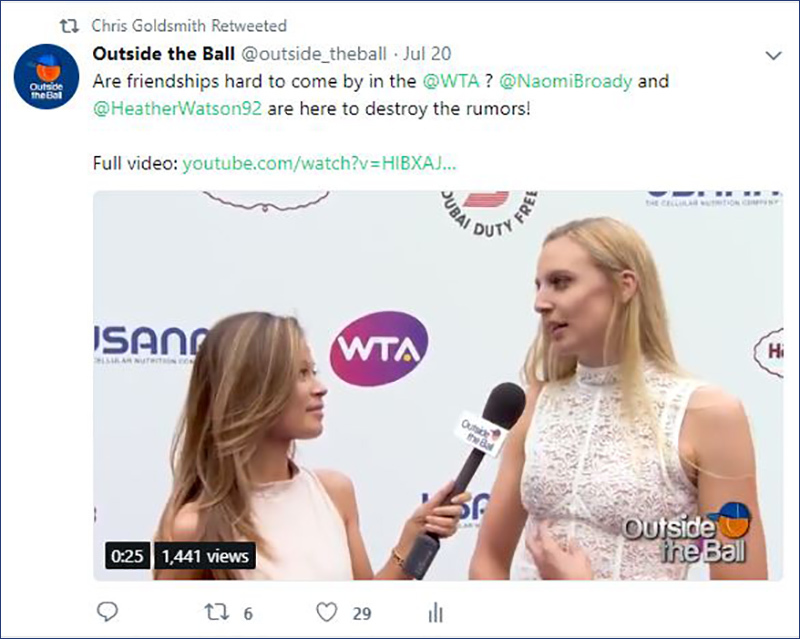 Tennis stars Lucie Safarova, Bethanie Mattek-Sands and Naomi Broady shared the coverage with their fans. 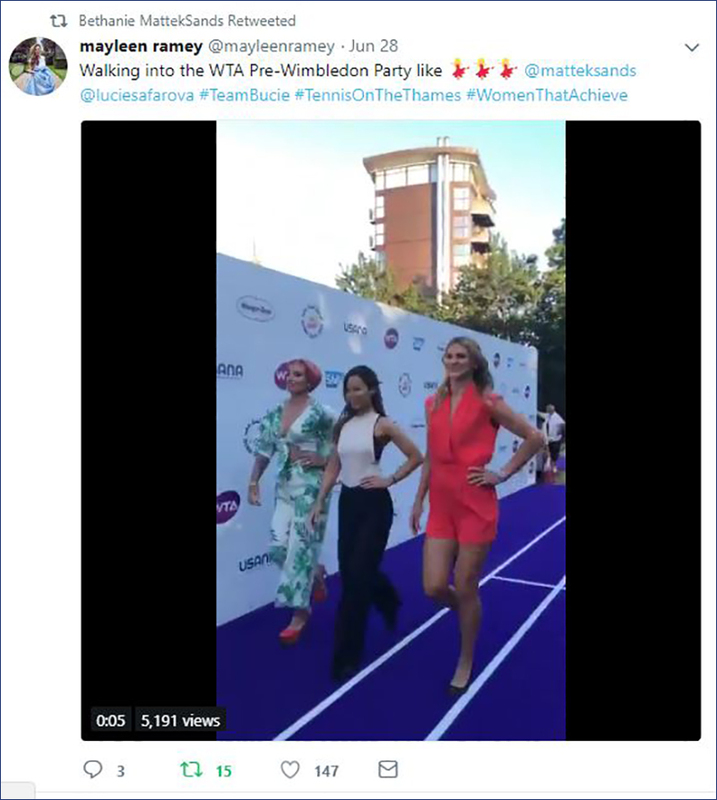 Mayleen Ramey spoke to WTA stars on the purple carpet of the Tennis on the Thames evening event that celebrated Women that Achieve. 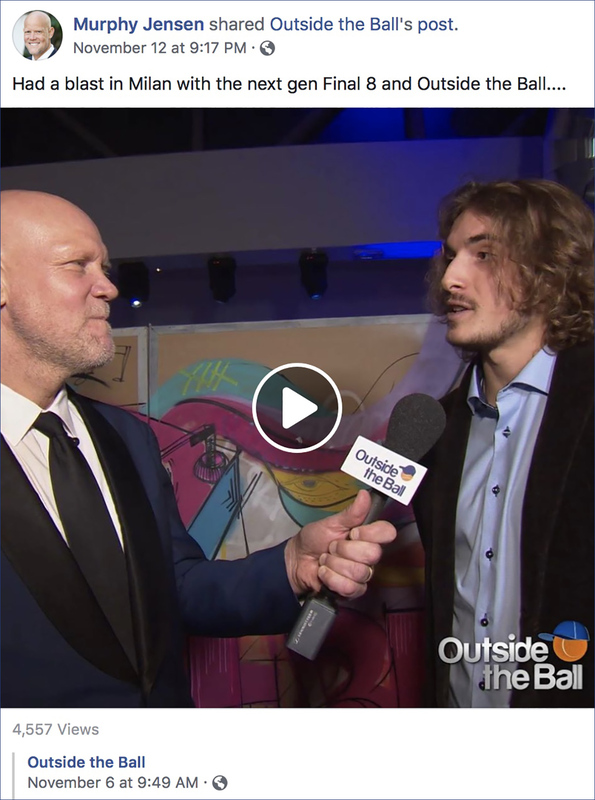 Outside the Ball filmed interviews and published live coverage on social media. 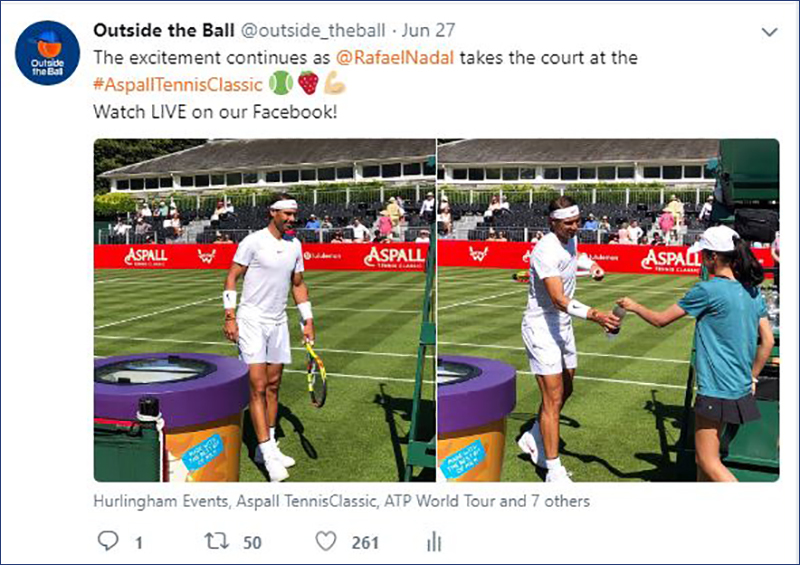 Outside the Ball attended the Aspall Tennis Classic that featured Rafael Nadal and Maria Sharapova. 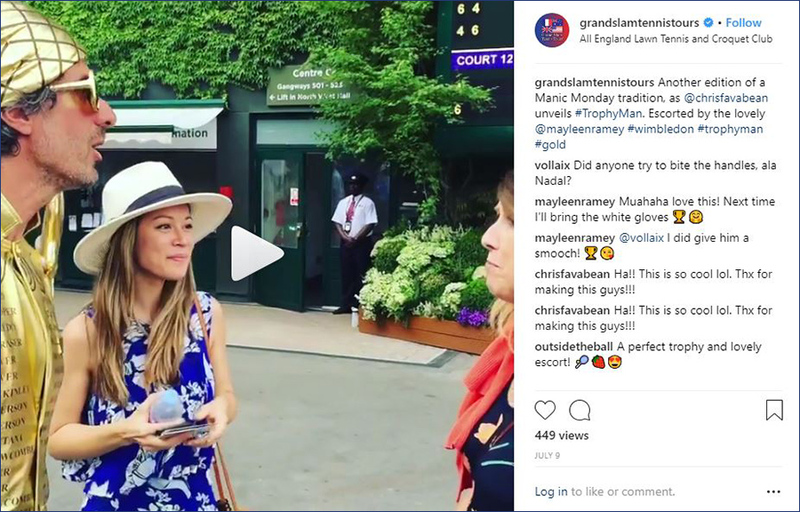 Host Mayleen Ramey and special correspondent Murphy Jensen cover the best tennis events in London including the Aspall Tennis Classic, The Boodles, and Wimbledon. 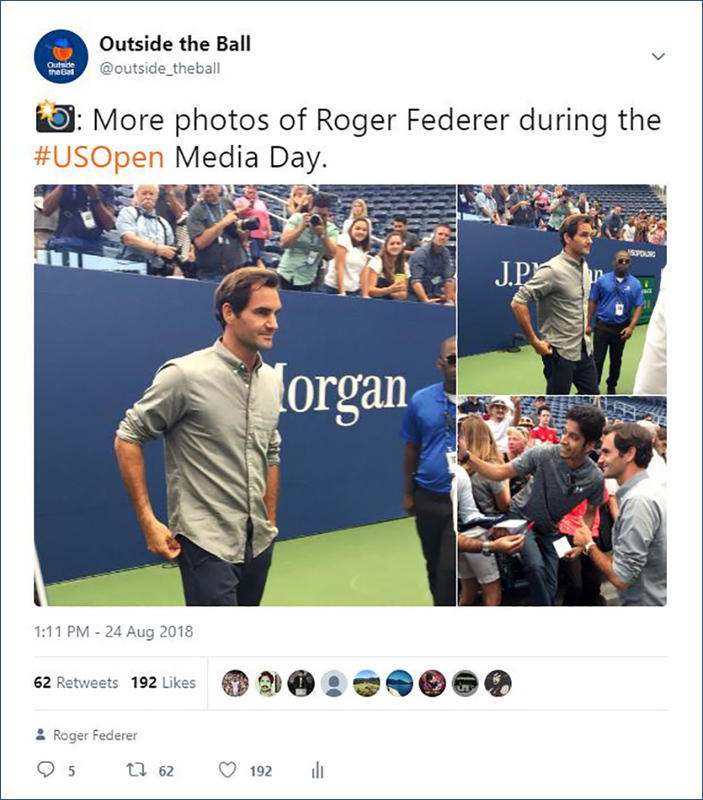 Tennis Now and Tennis Panorama News shared their excitement. 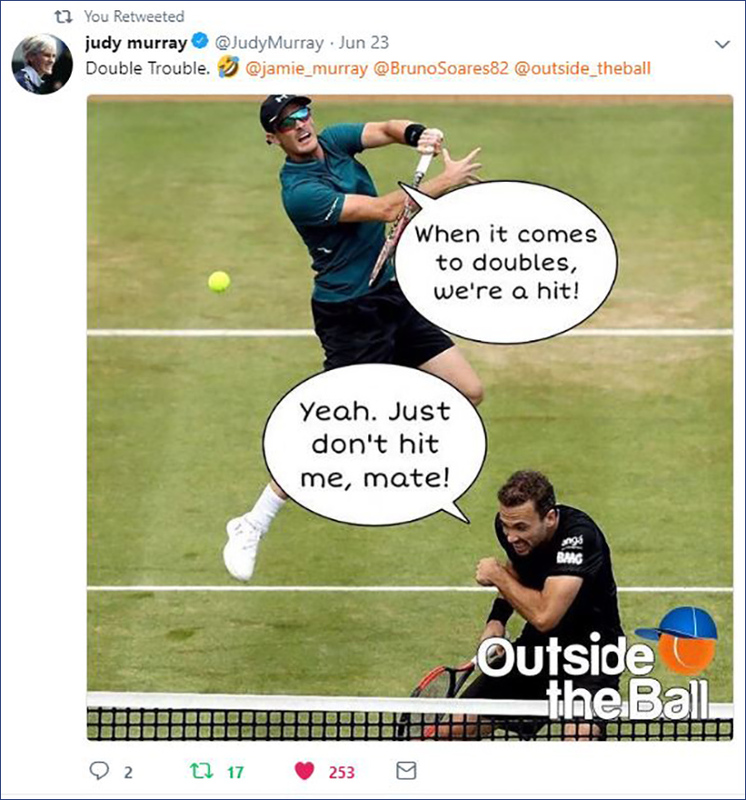 Judy Murray shared Outside the Ball's playful Meme from the Top10s Photos of the Week that starred her son Jamie Murray and Bruno Soares. 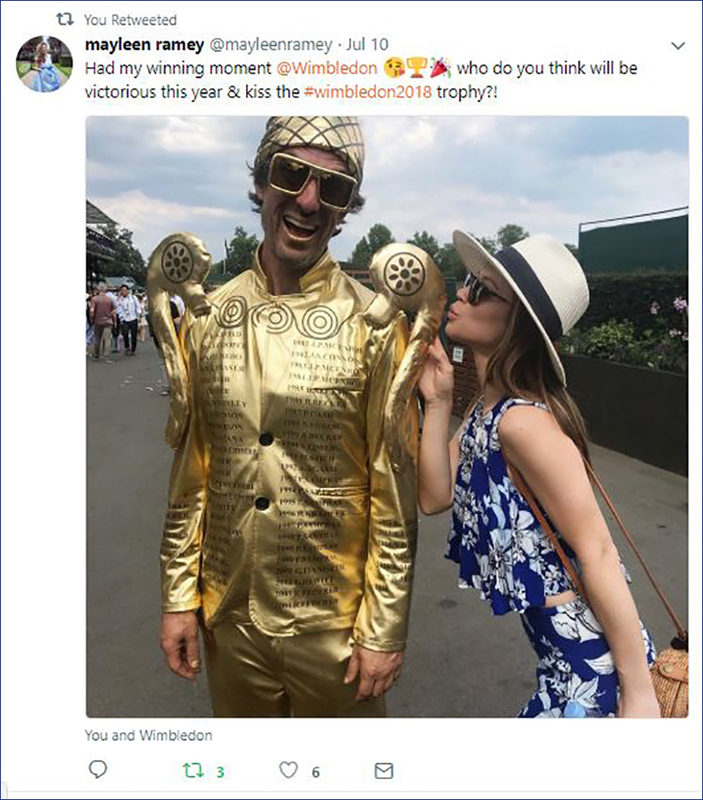 In a fun interview, Feliciano Lopez revealed his celebrity crushes to Mayleen Ramey and Tennis Panorama News shared the video to their Twitter followers. 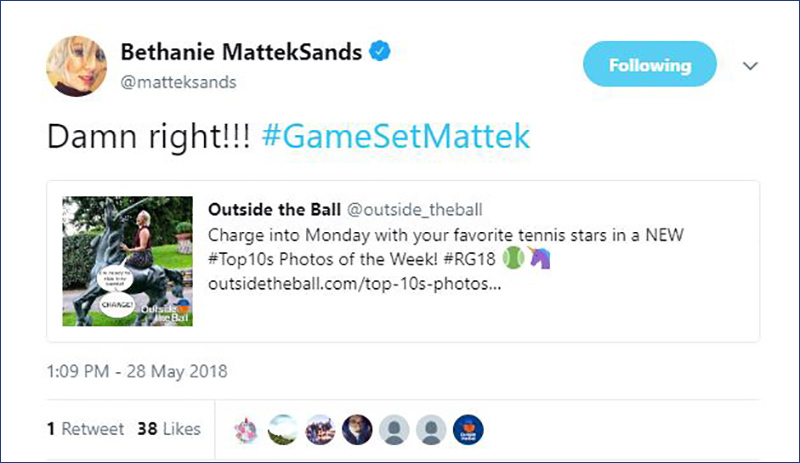 Bethanie Mattek-Sands enjoyed the photo Meme that goes along with the Top10s Photos of the Week. She shared it with her Twitter followers. We partnered with Lacoste and Guillermo Garcia Lopez to give one lucky fan gear signed by the tennis pro. 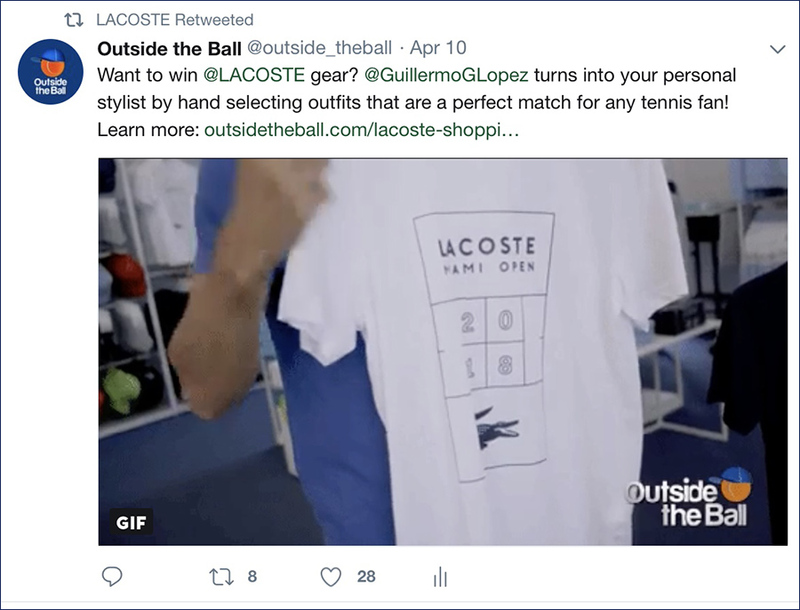 Guillermo Garcia Lopez came on a Lacoste shopping spree with us and hand selected giveaway outfits that are a perfect match for any tennis fan. Guillermo signed the gear and Lacoste tweeted about it to their 1 million+ fans. 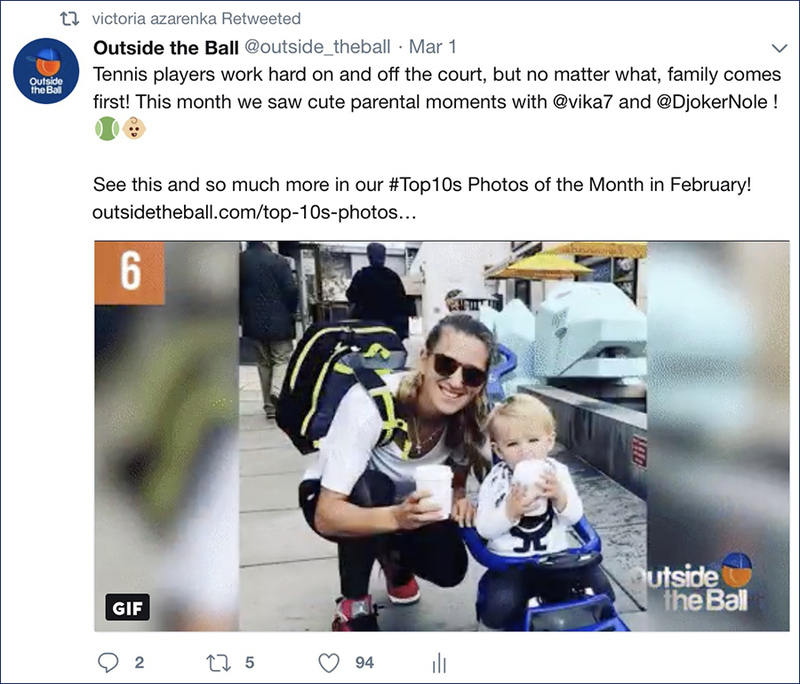 We featured this adorable photo of Victoria Azarenka and Baby Leo taking a walk in our Top 10s Photos of the Month and Azarenka retweeted it to her 1.4 million+ followers. 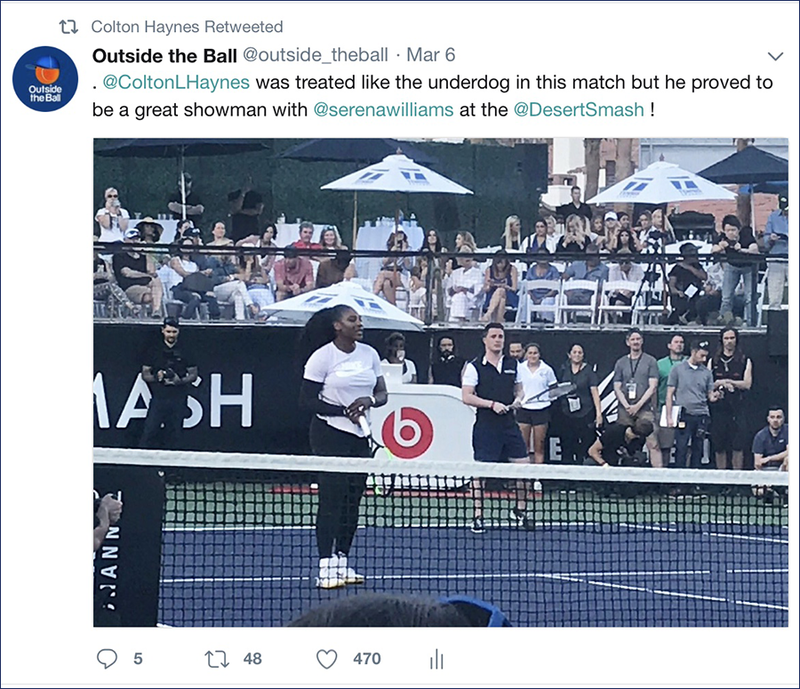 Colton Haynes and Serena Williams are the perfect team and we had fun watching them play together at Desert Smash and Colton shared our tweet with his 2 Million+ followers. 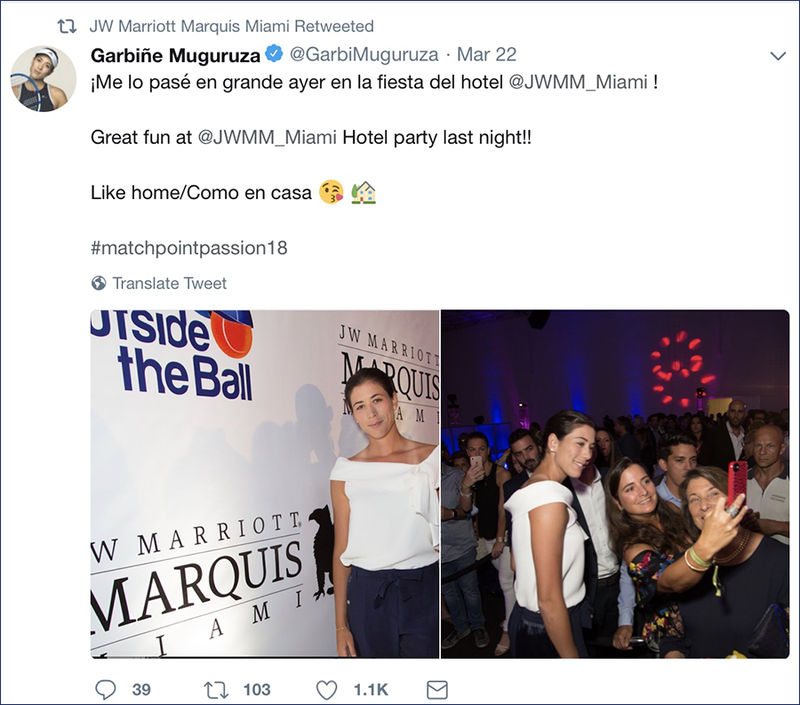 Outside the Ball was the exclusive broadcast and digital media partner for the Match Point Passion Party at the JW Marriott Marquis Miami and Garbiñe Muguruza tweeted about how much fun she had with her 448,000+ Twitter followers and the JW Marriott Marquis Miami retweeted it to their 1,600+ followers. Who doesn't love a great party? 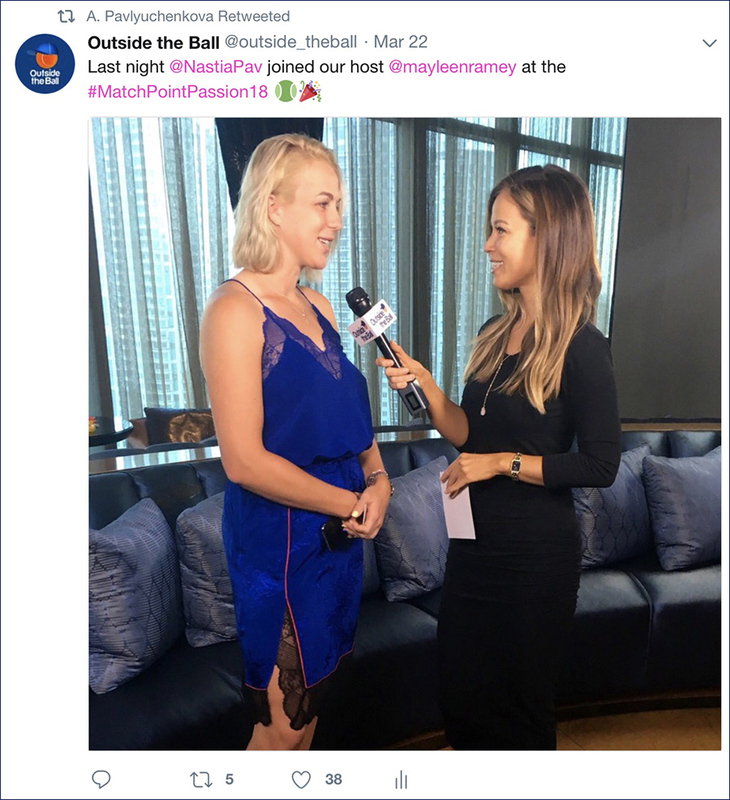 Anastasia Pavlyuchenkova talked to our host Mayleen Ramey before the Match Point Passion Party in Miami and then tweeted about it to her 73,000 followers. 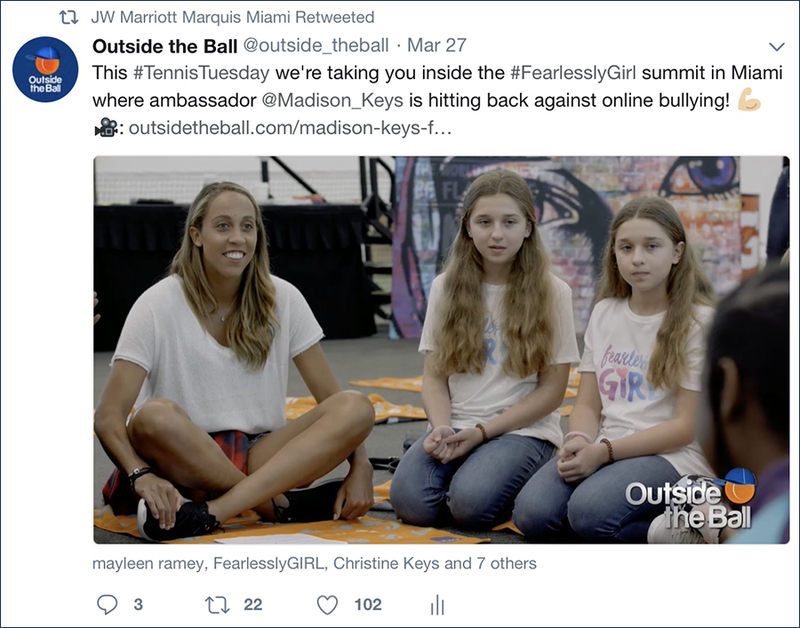 We met up with Madison Keys at the FearlesslyGirl summit in Miami to discuss how the organization is hitting back against bullying and Madison and her mom Christine Keys shared our video with their 200,000+ fans on Twitter, FearlesslyGirl shared it with their 1,700+ Facebook fans, the WTA featured it on their website, Tennis.com shared it with their 208,000+ Twitter followers and featured it on the Baseline website and the JW Marriott Marquis Miami where the summit was hosted shared it with their 1,645 followers on Twitter. 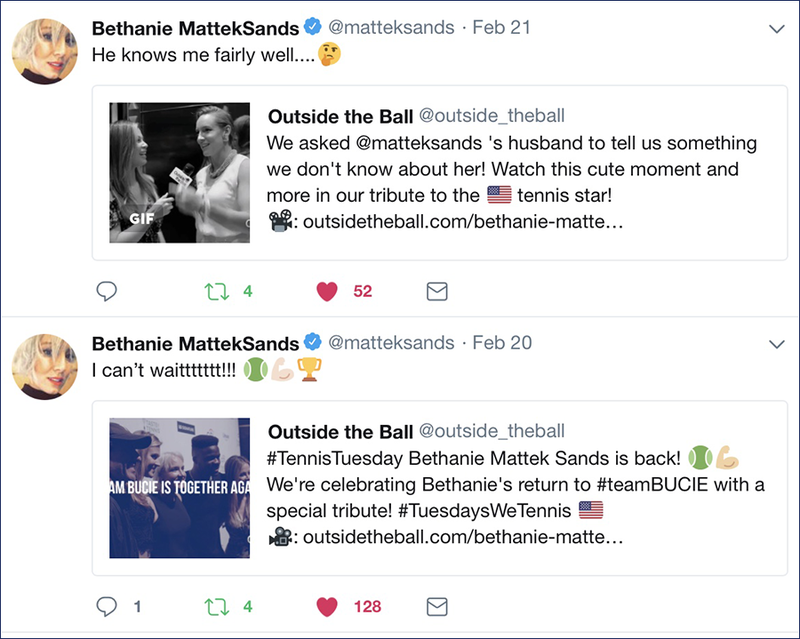 We celebrated Bethanie Mattek-Sand's return to #teamBucie with a special tribute and asked her husband to tell us something we don't know about her. Bethanie agreed that her husband knows her pretty well and shared the video with her 67,500+ Twitter followers. 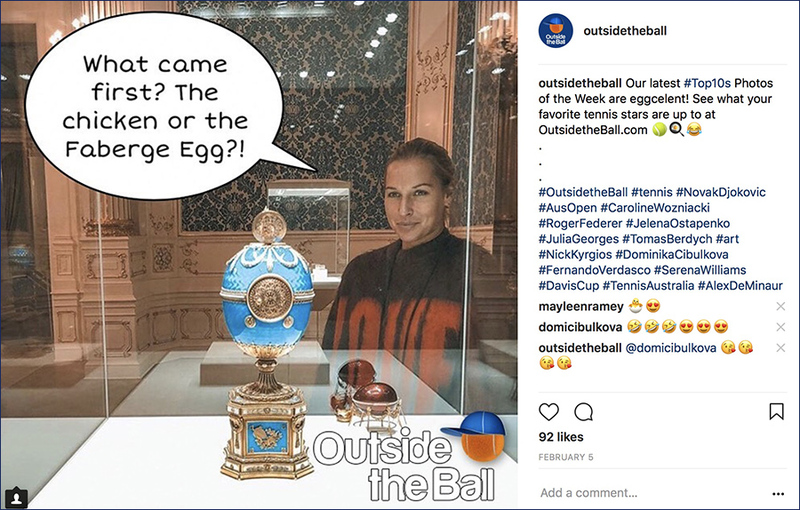 Dominika Cibulkova cracked up over our Faberge Egg meme and shared it with her Instagram followers. 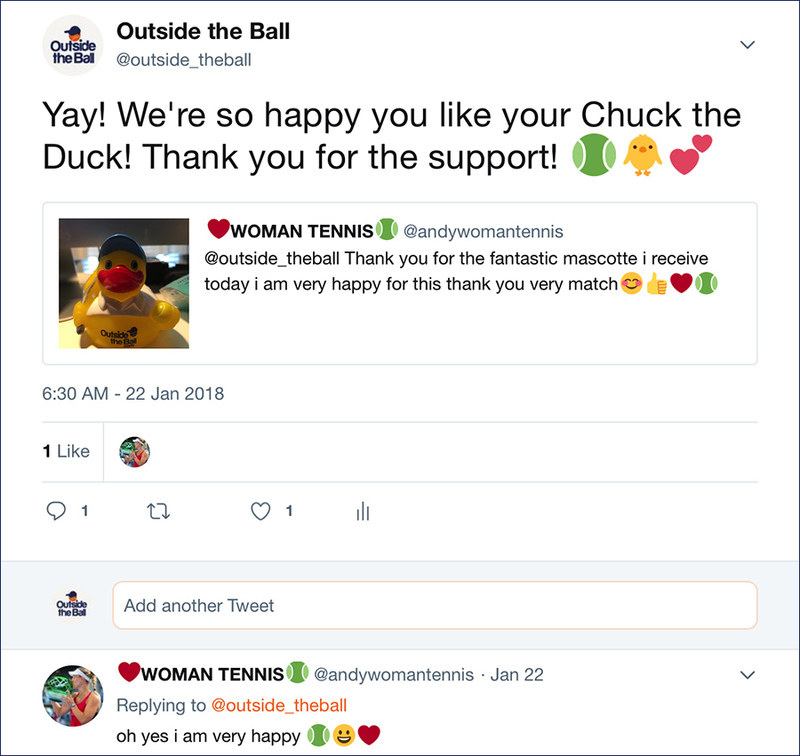 This Twitter poster became one happy tennis fan as she received Outside the Ball's mascot Chuck the Duck as a prize for our giveaway. 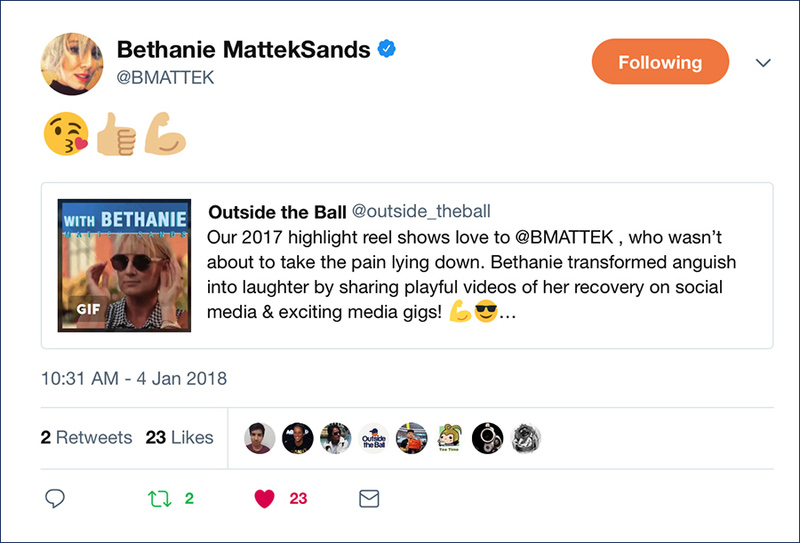 American Bethanie Mattek Sands shared our 2017 Highlight Reel to her 65,600 + Twitter followers which included footage of her media career with Tennis Channel and ESPN as she recovers from injury.